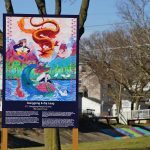 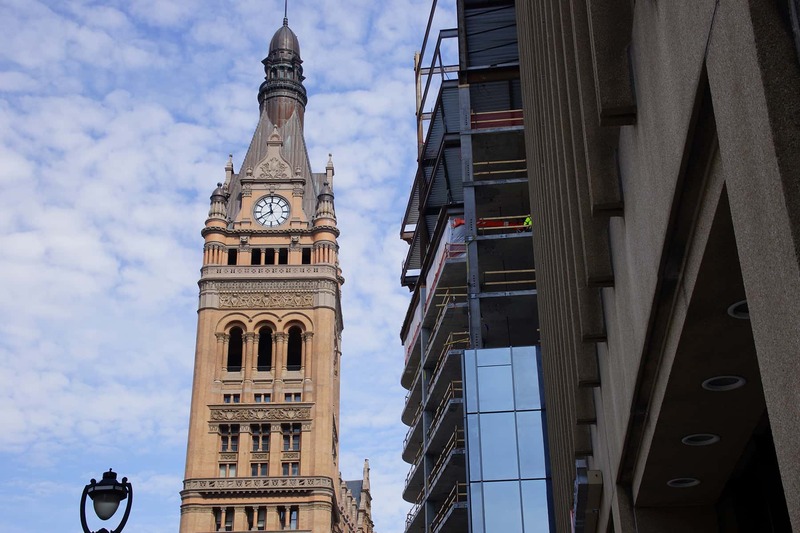 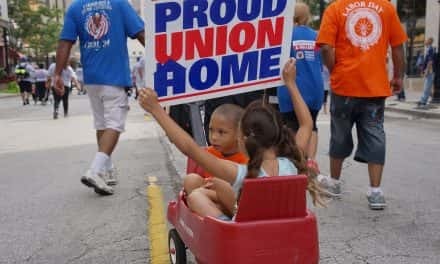 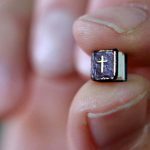 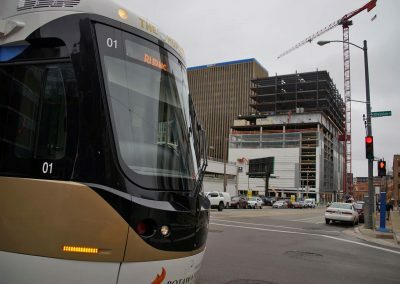 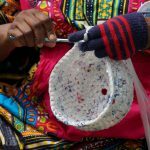 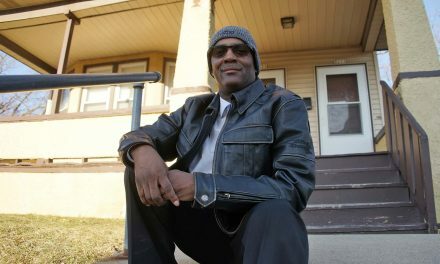 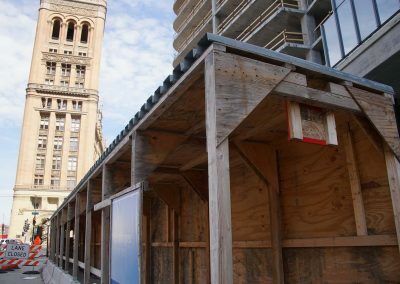 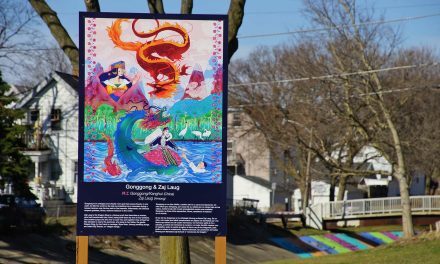 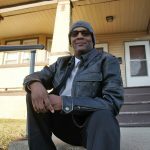 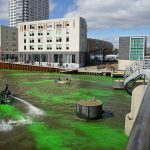 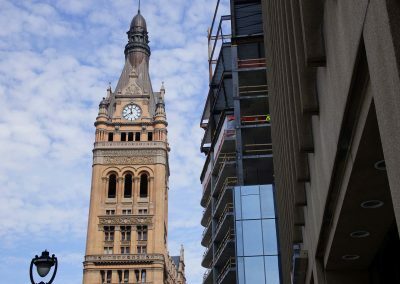 As spring comes to Milwaukee, even with a last gasp of winter snow, two sites within a few city blocks both share a special and alternative fate. 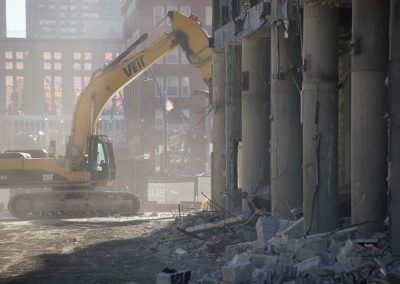 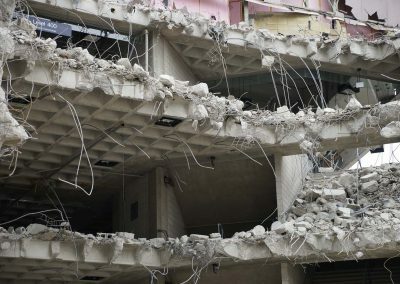 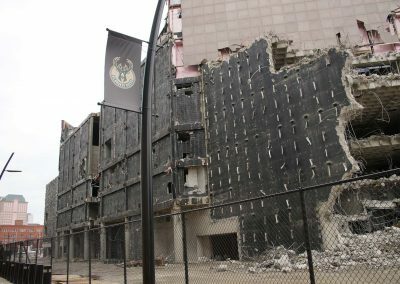 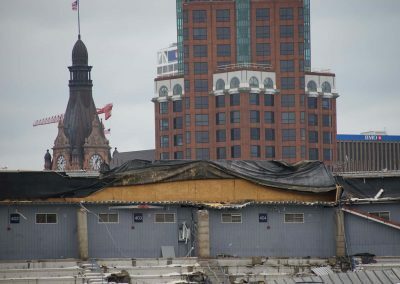 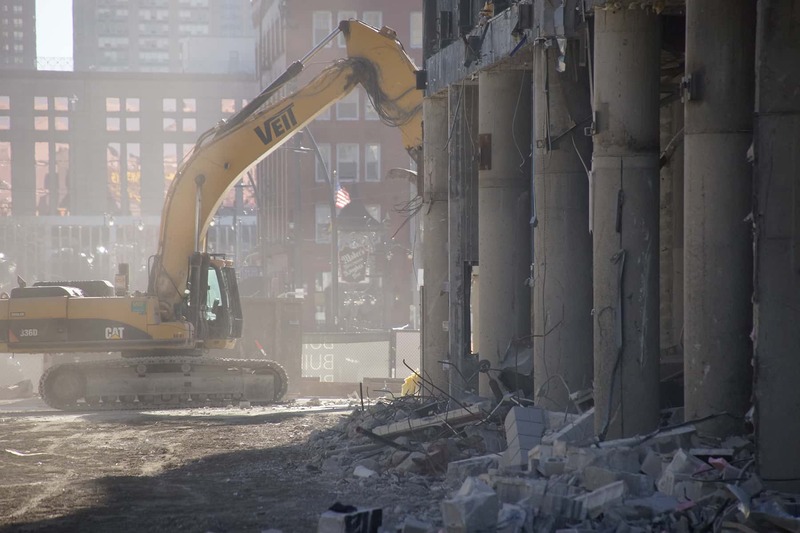 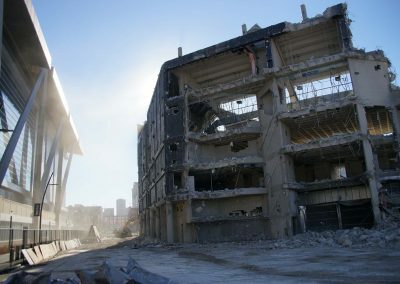 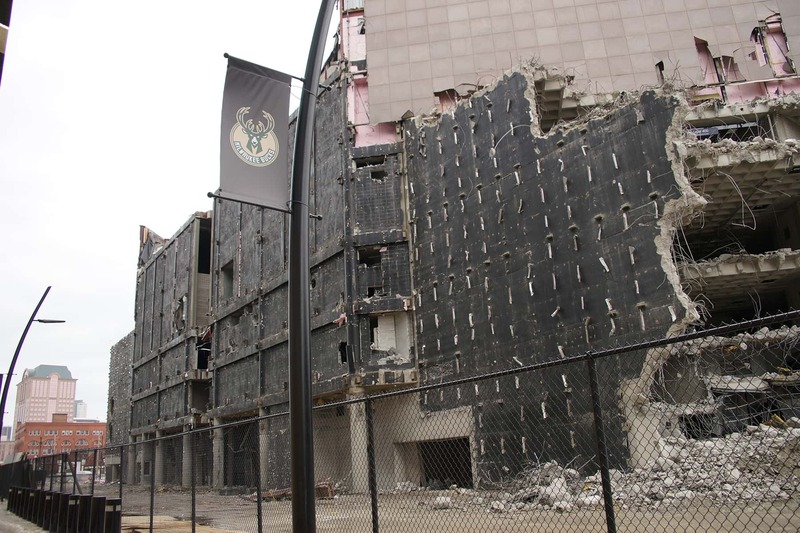 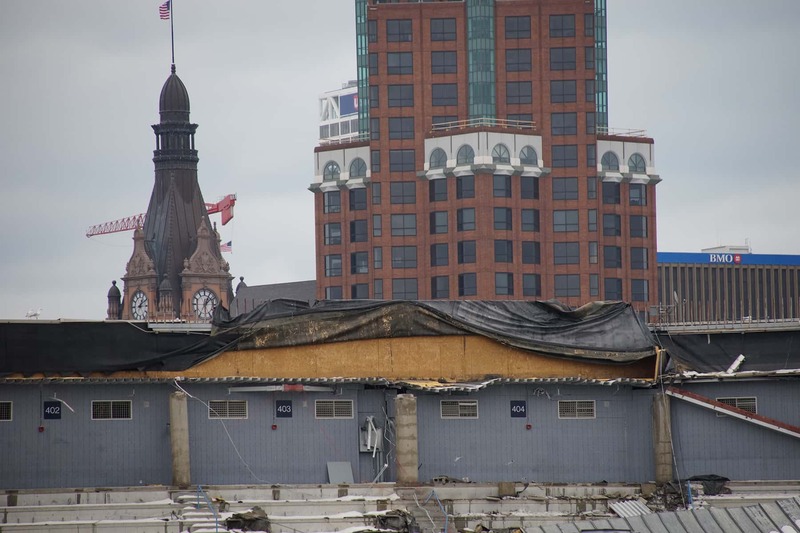 On the west side of the Milwaukee River, a landmark is midway finished with its demolition. 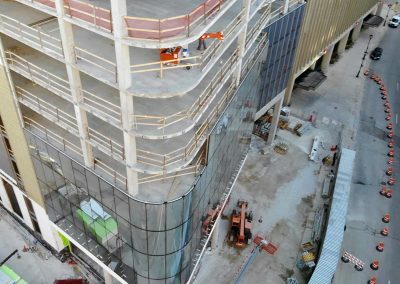 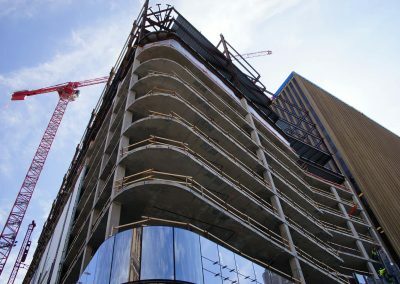 On the east side of the river, a new skyscraper takes shape. 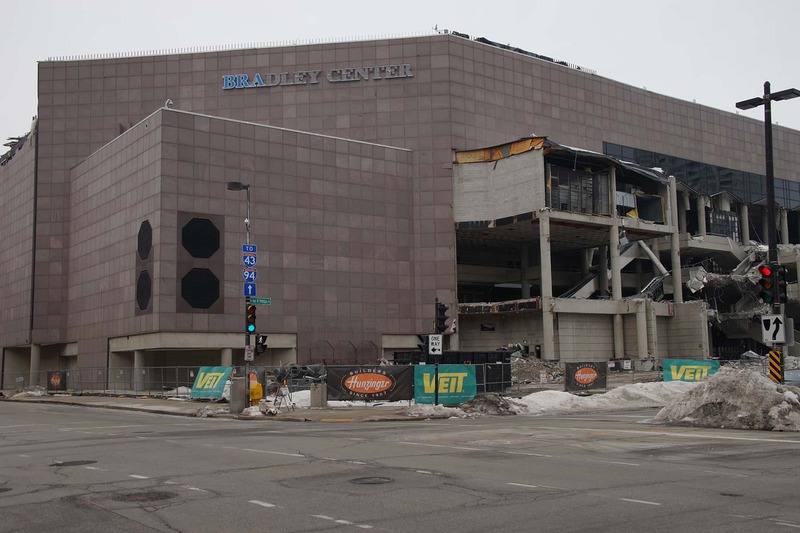 One structure is torn down while the other is built up, and both related to BMO Harris Bank. 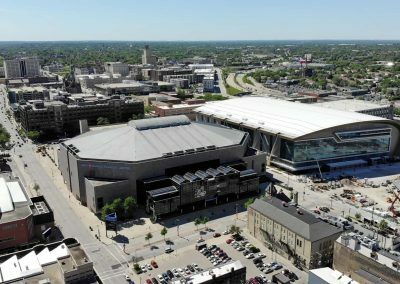 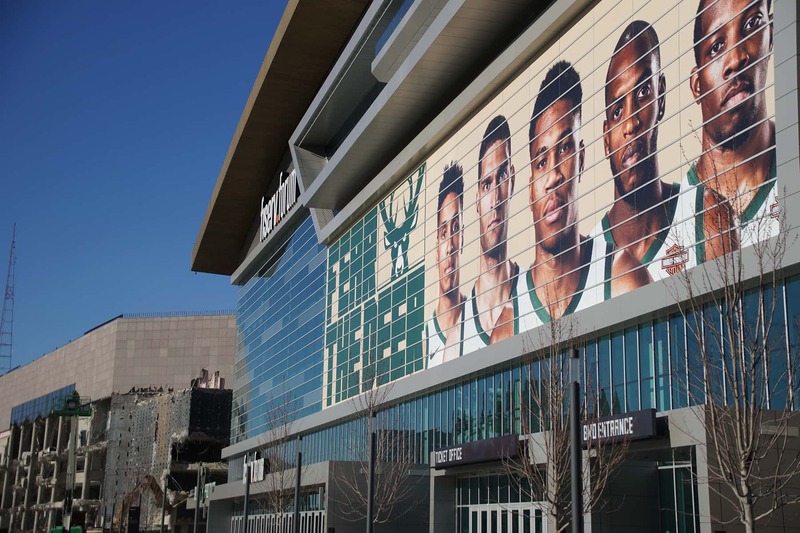 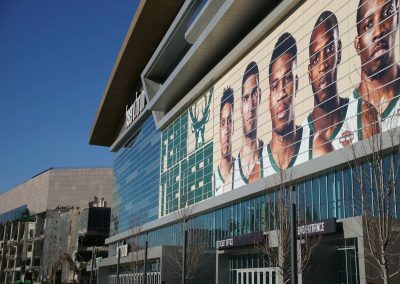 In 2012, BMO purchased the naming rights for the Bradley Center from then owner of the Milwaukee Bucks, Herb Kohl. 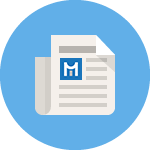 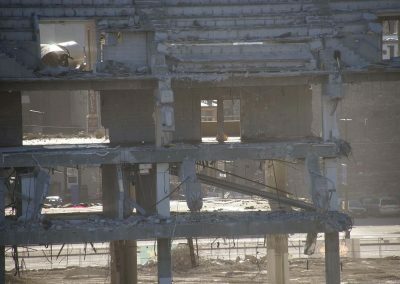 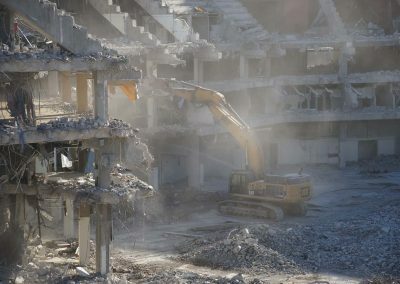 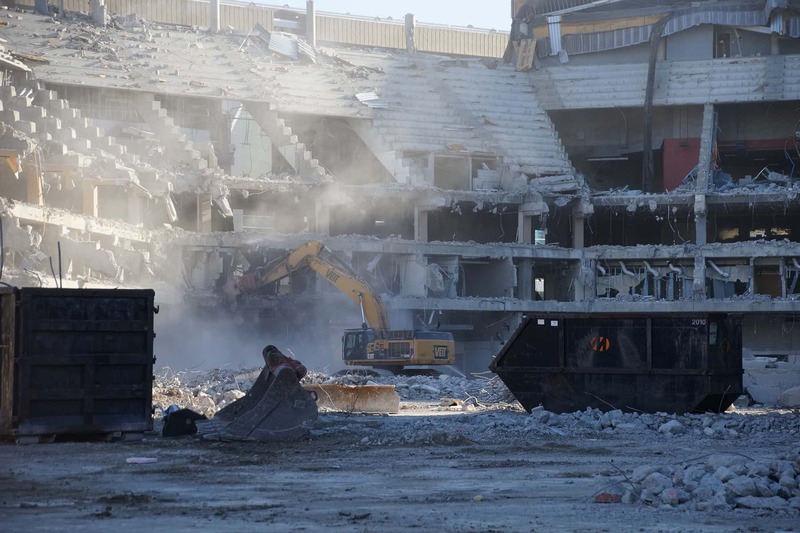 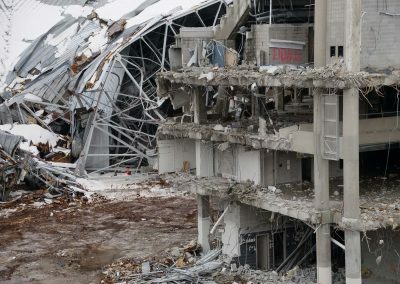 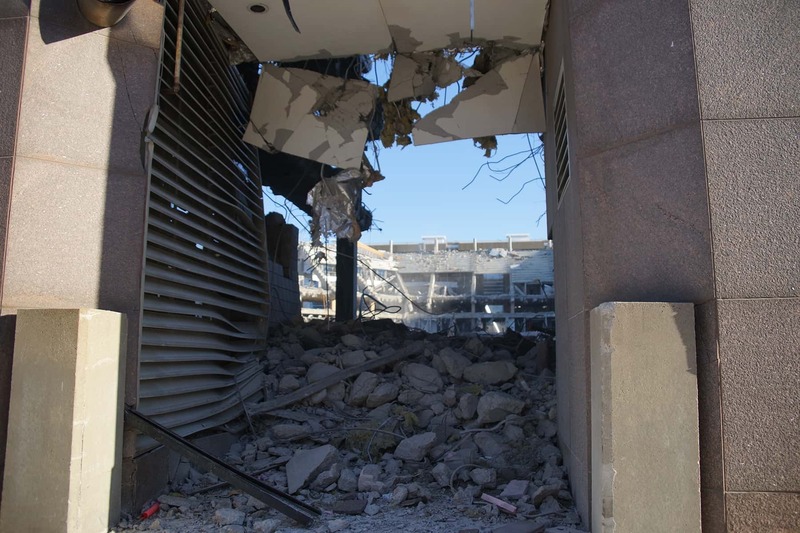 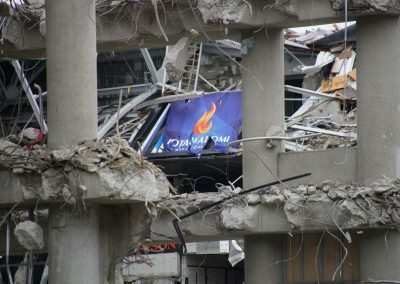 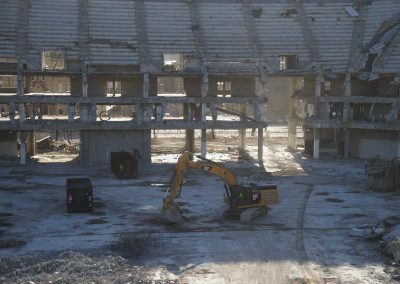 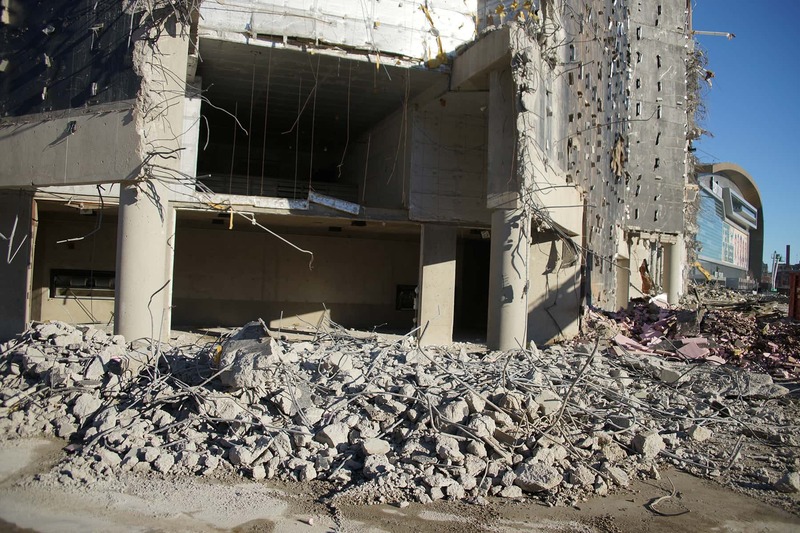 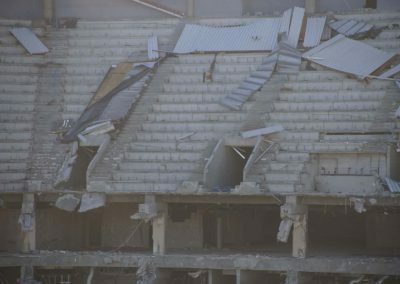 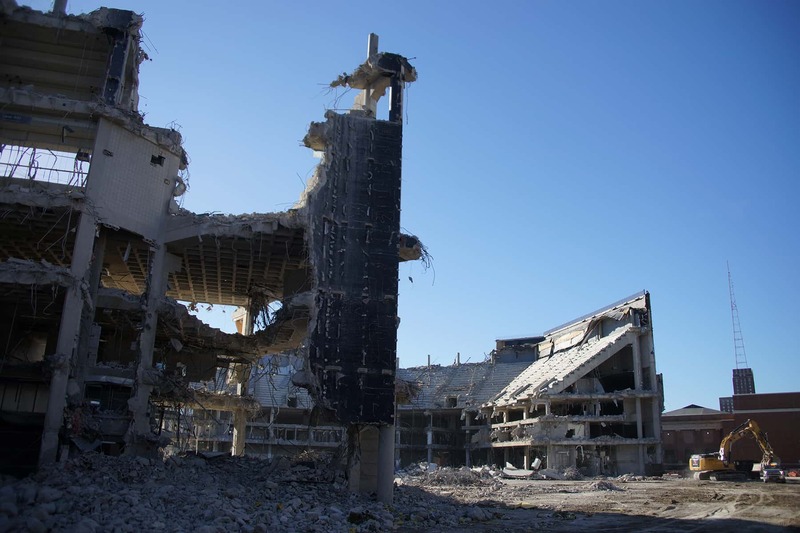 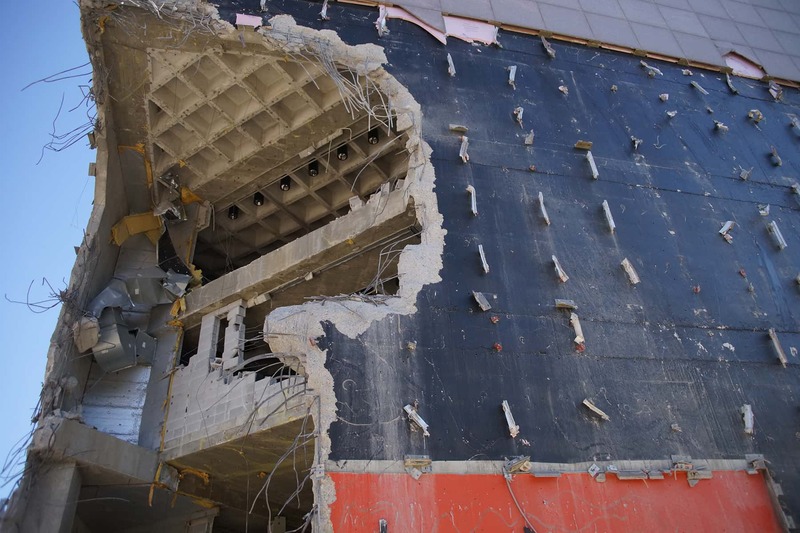 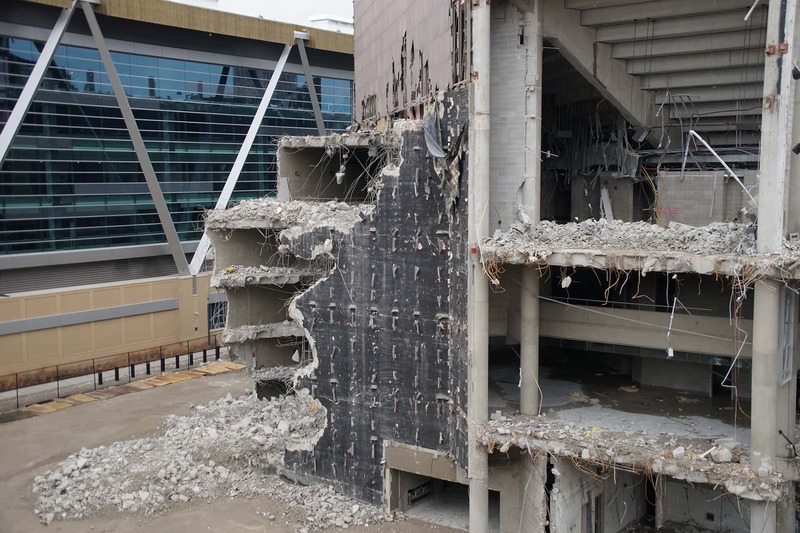 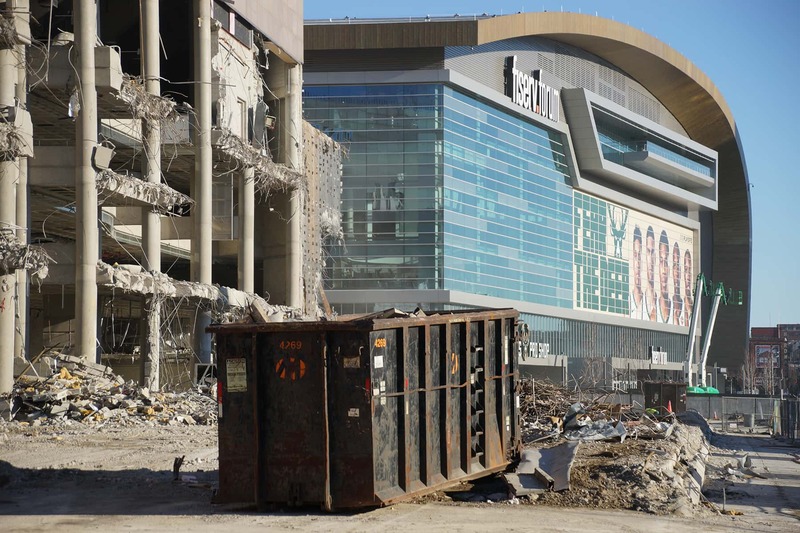 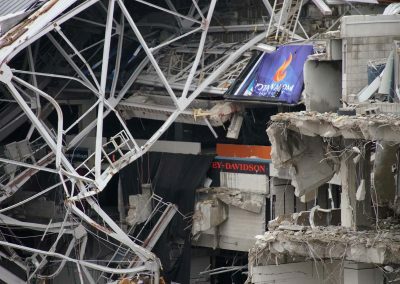 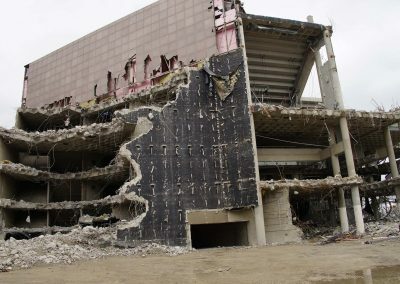 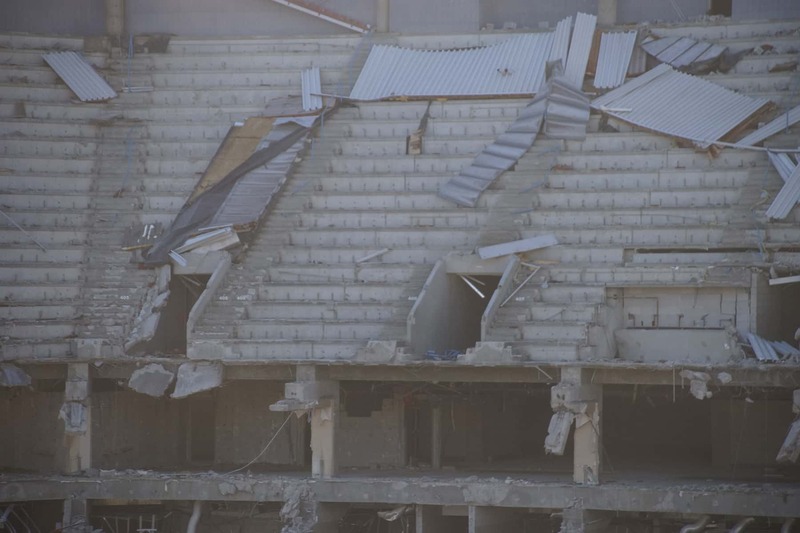 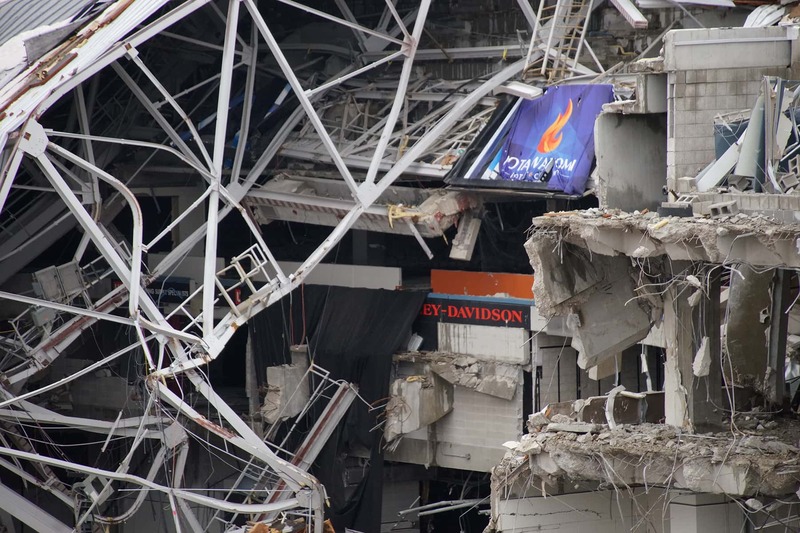 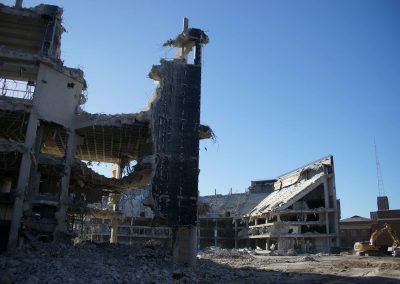 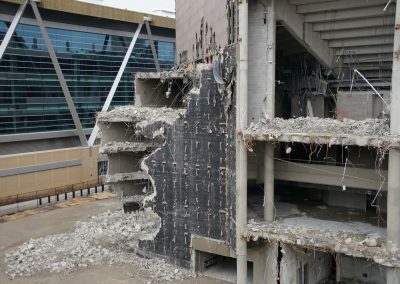 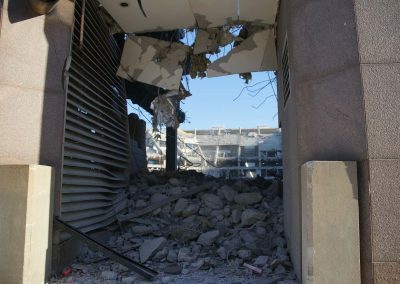 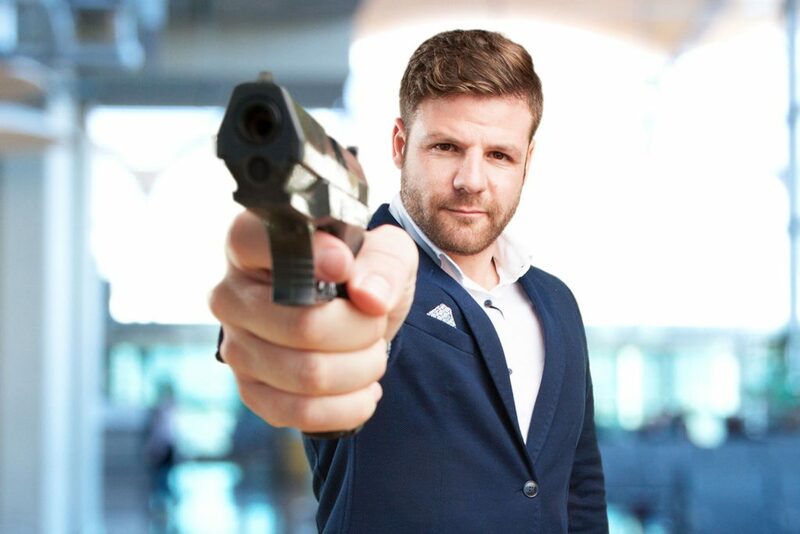 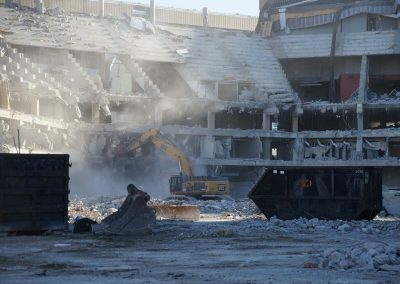 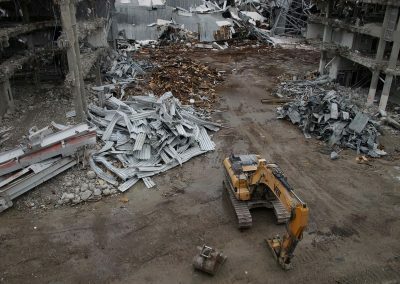 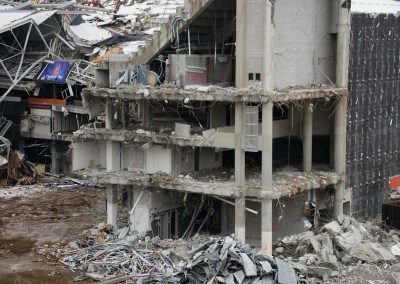 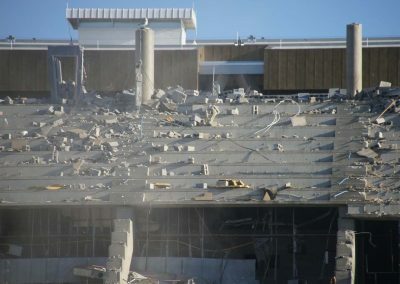 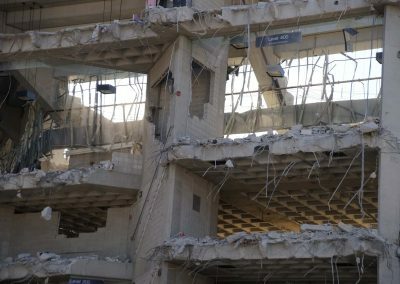 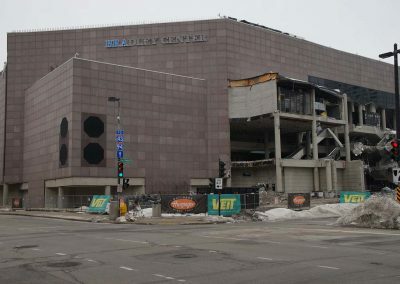 That remained in place until just before the sports arena’s demise on January 13, 2019. 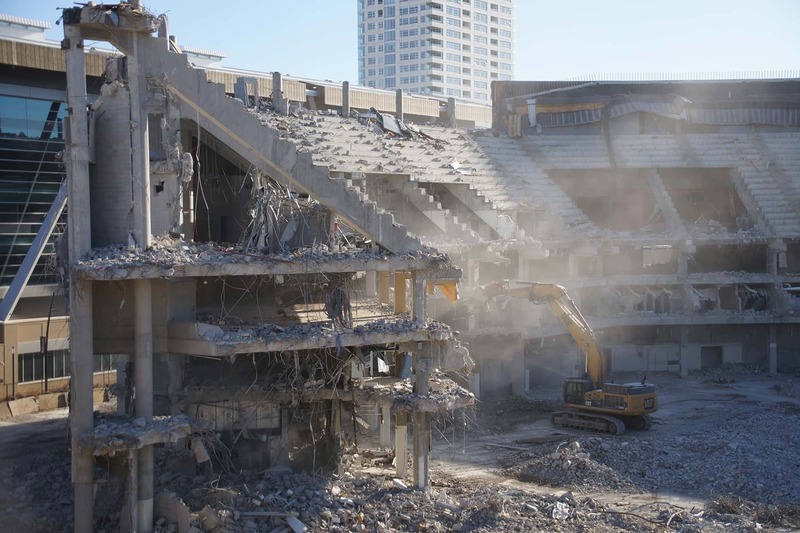 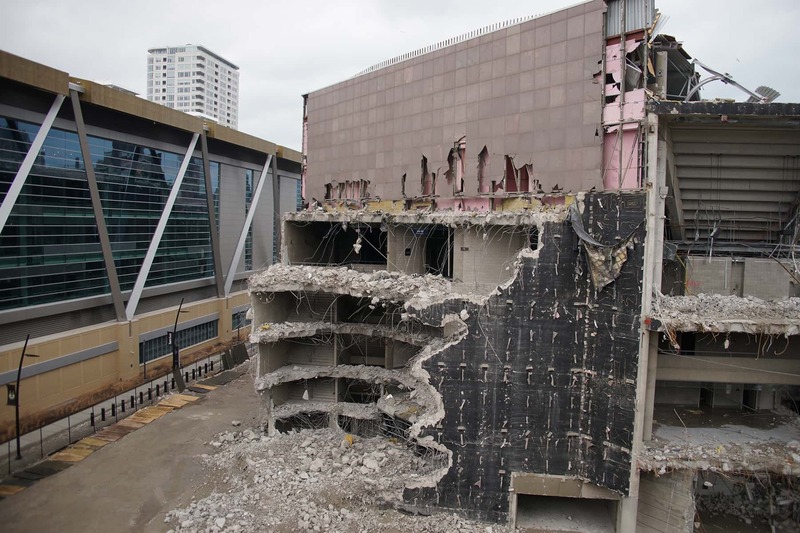 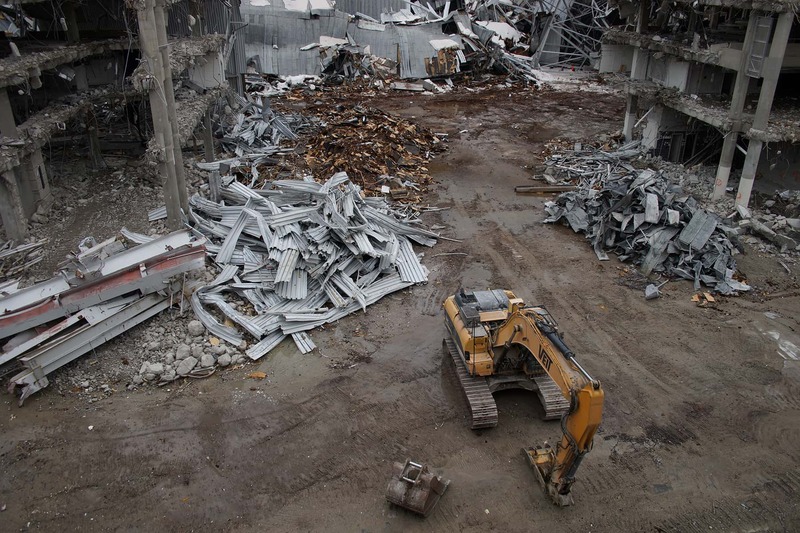 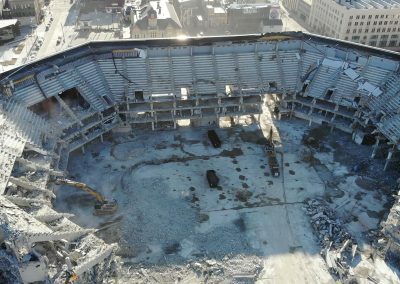 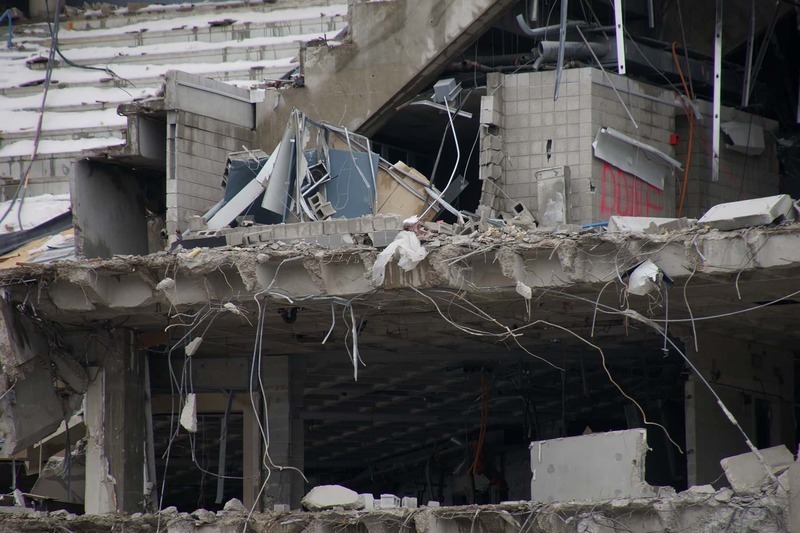 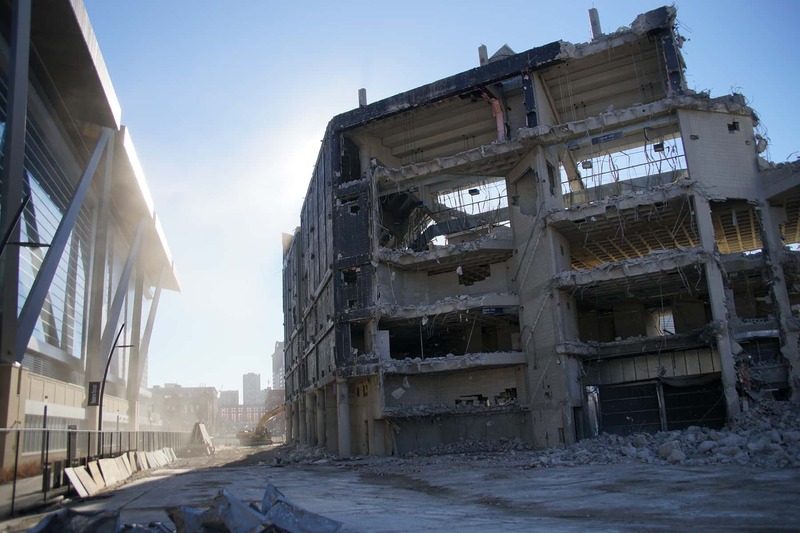 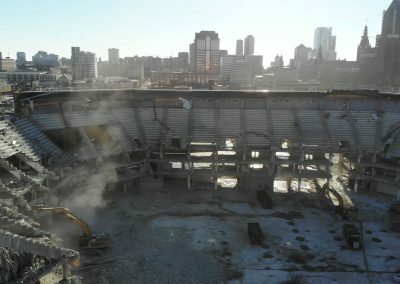 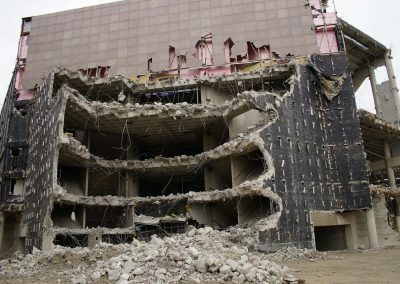 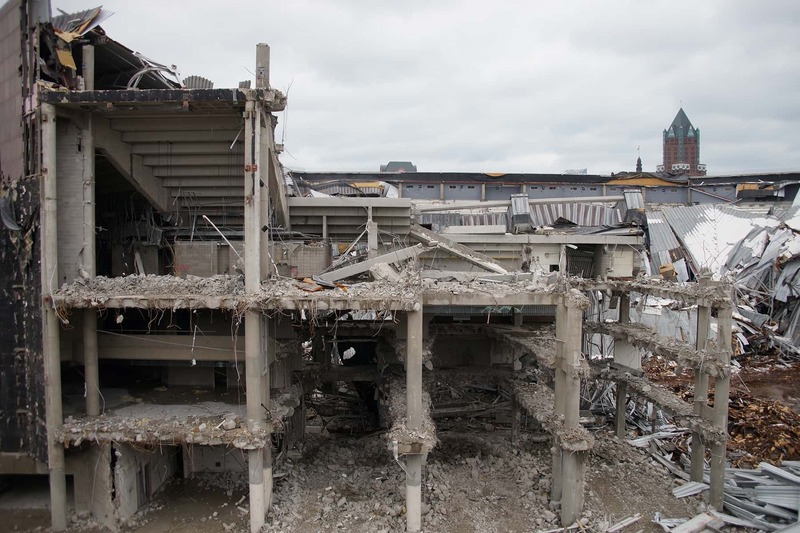 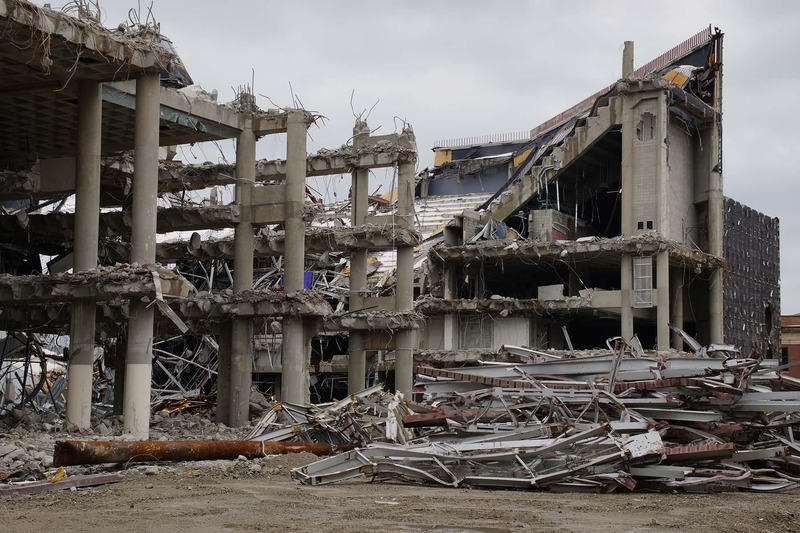 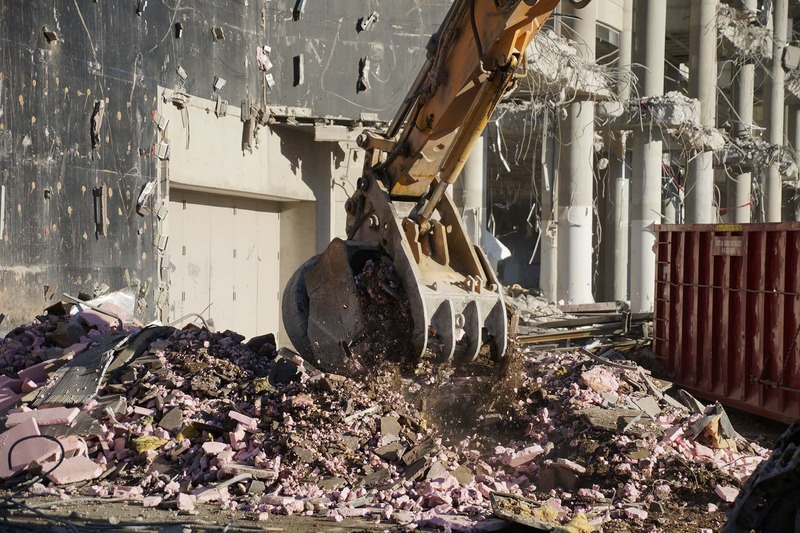 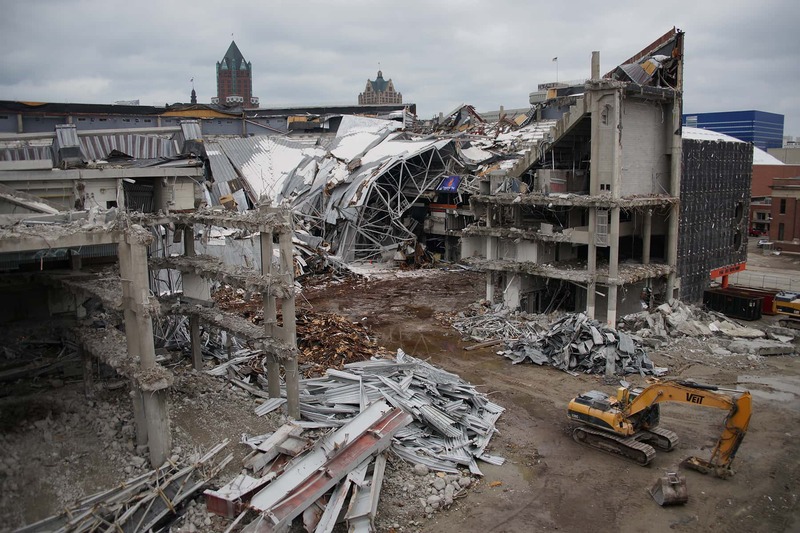 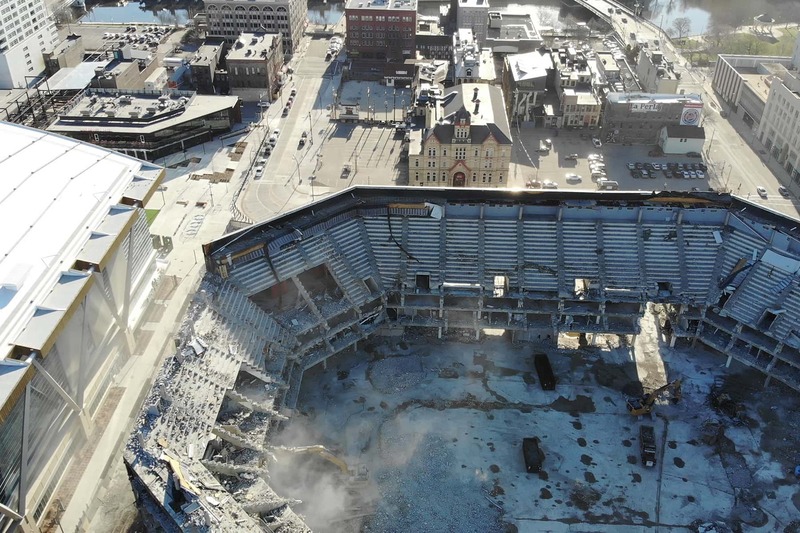 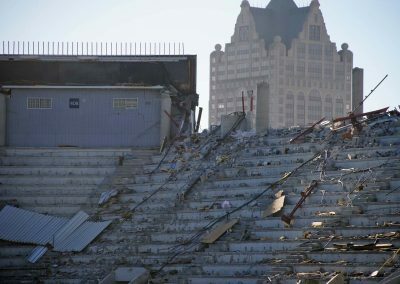 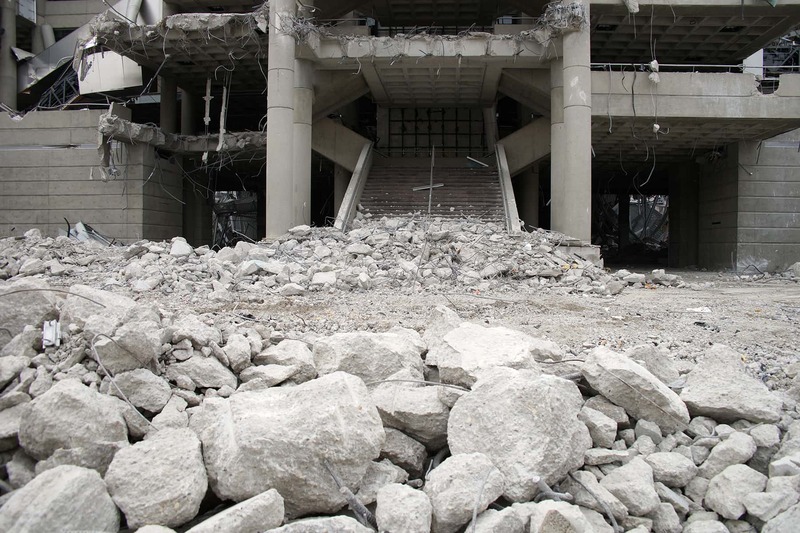 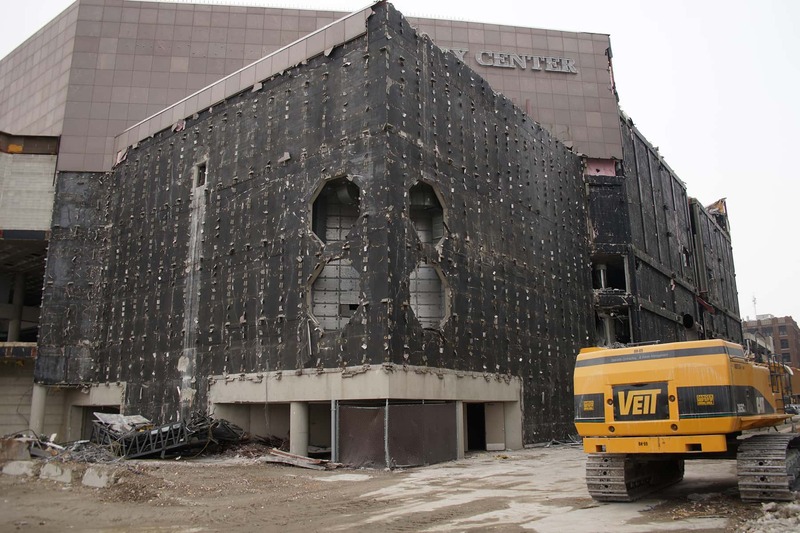 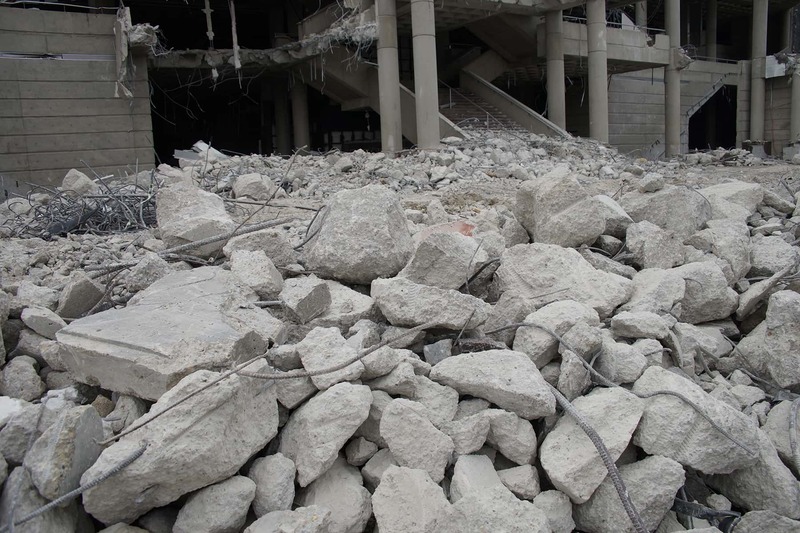 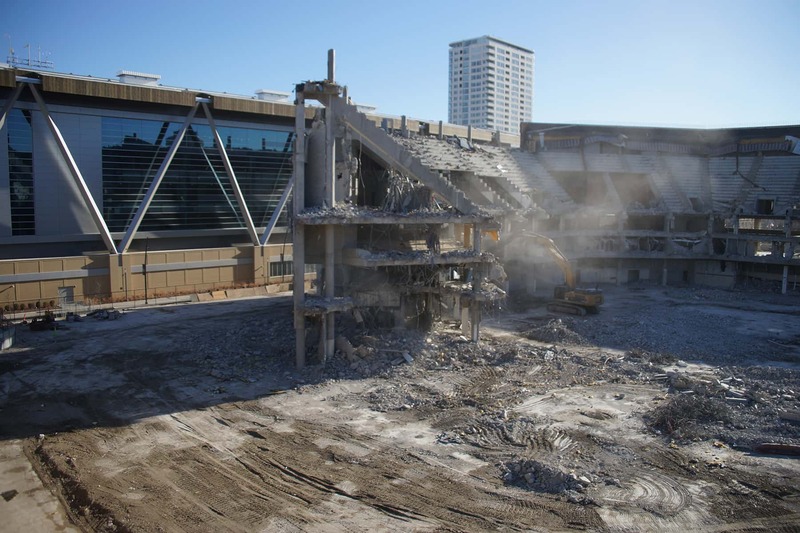 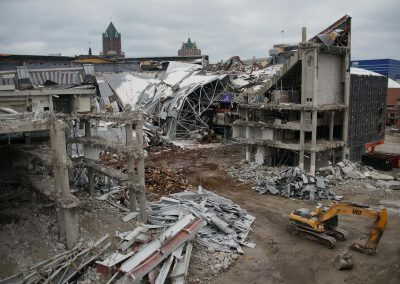 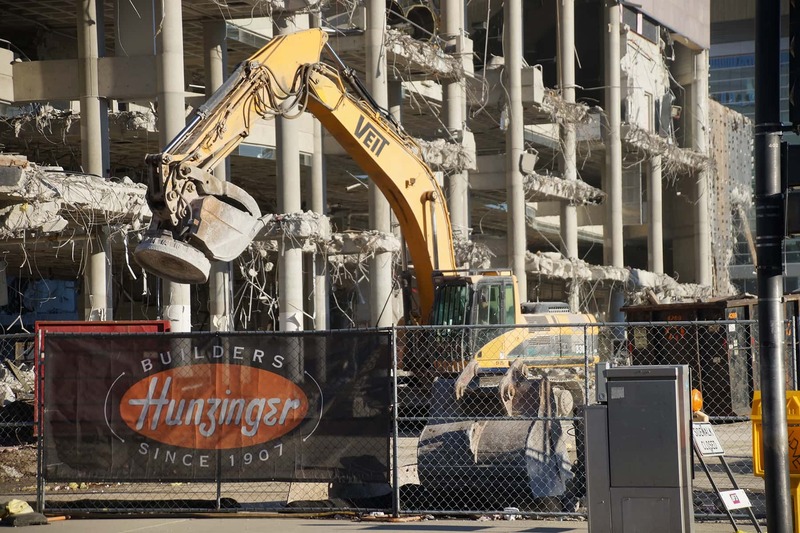 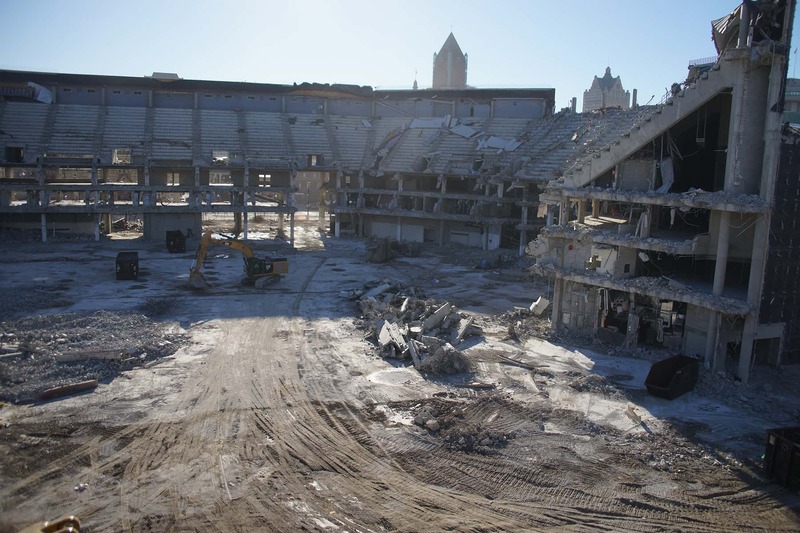 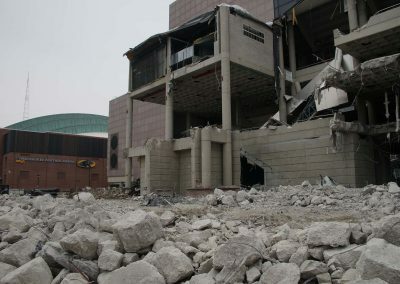 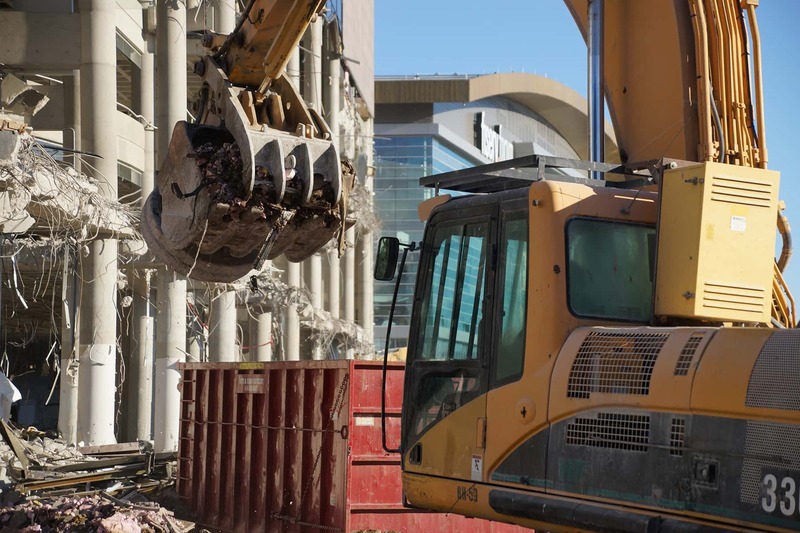 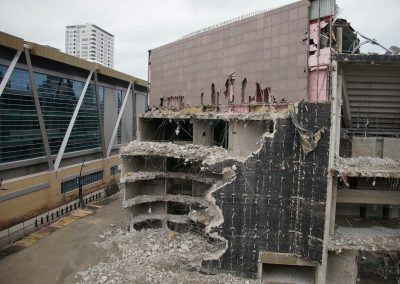 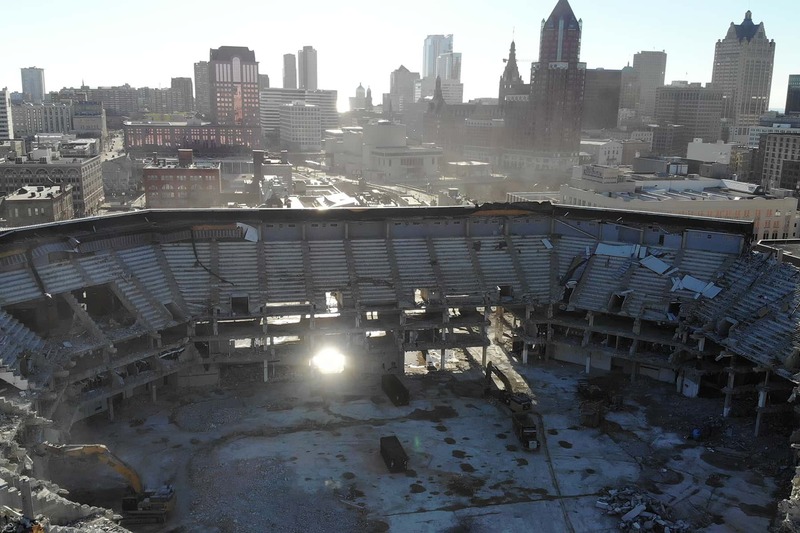 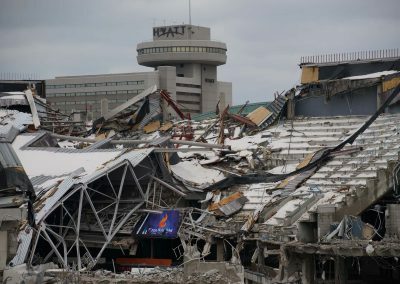 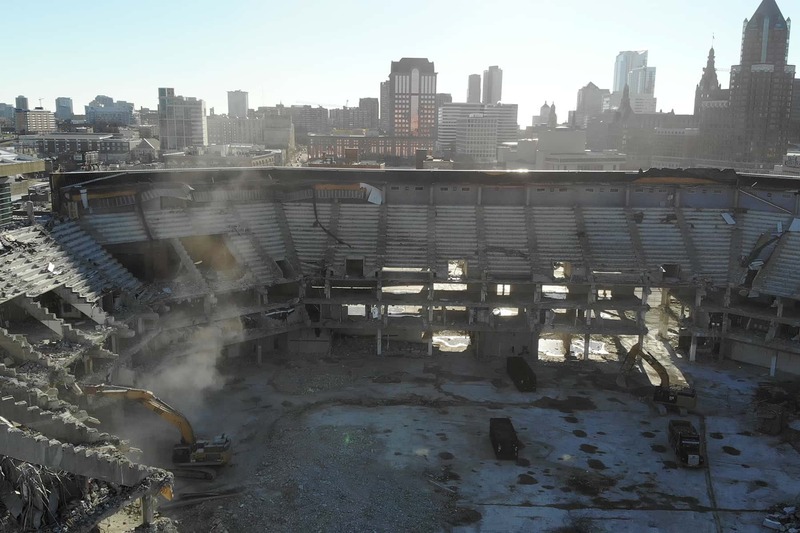 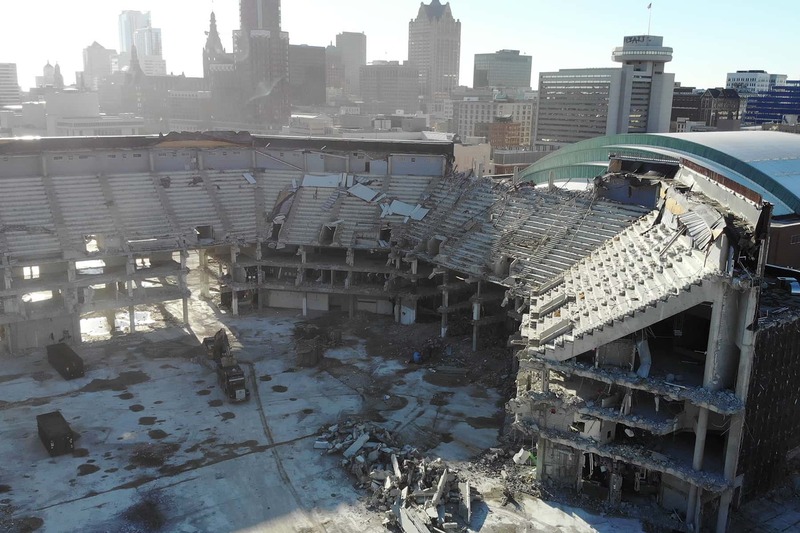 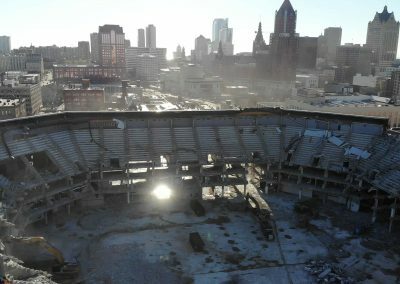 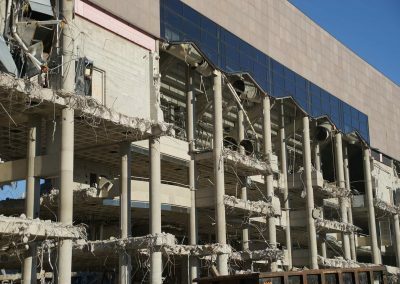 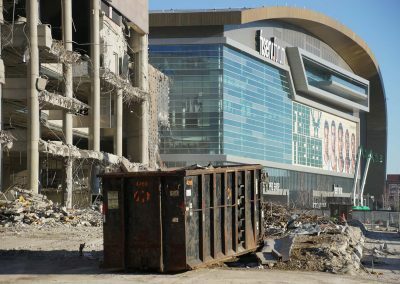 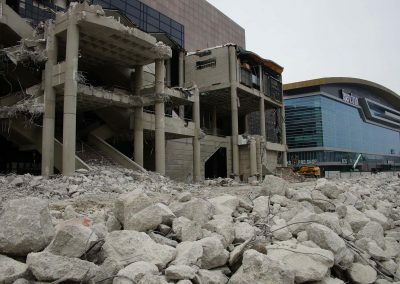 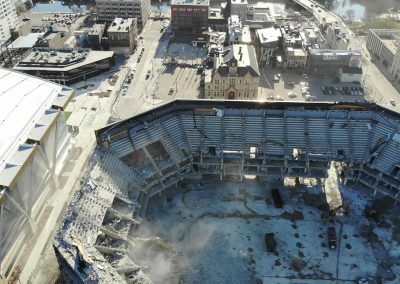 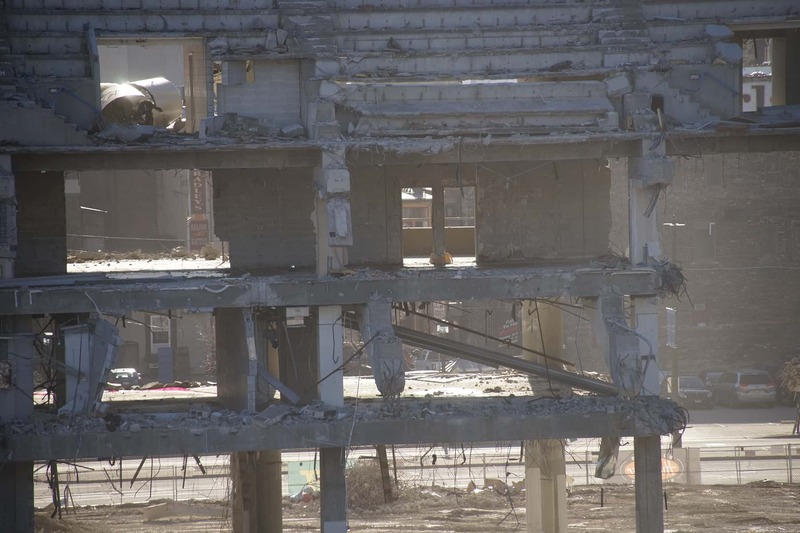 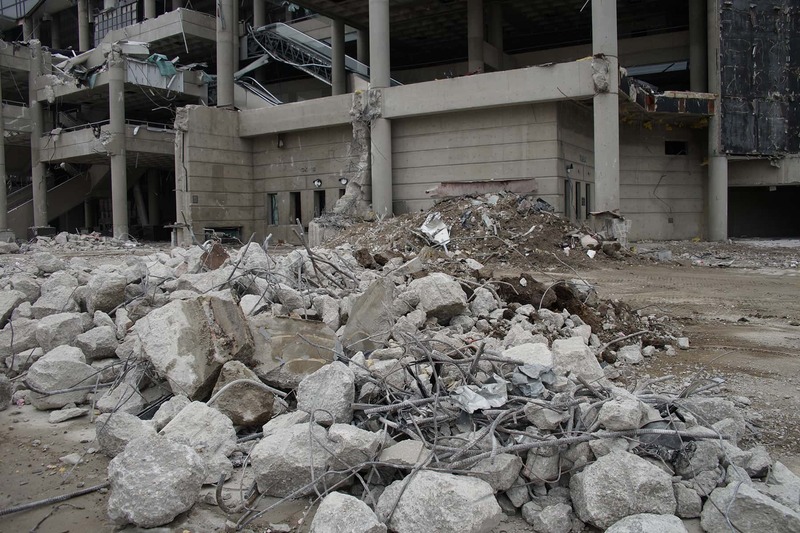 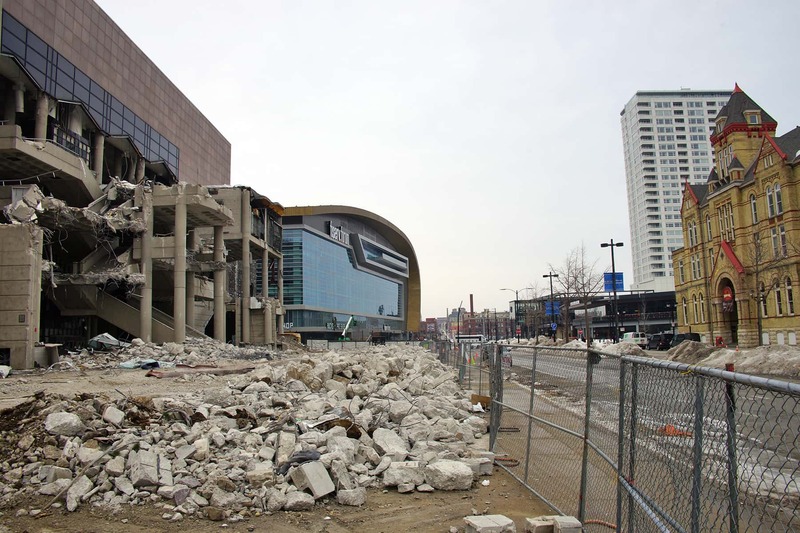 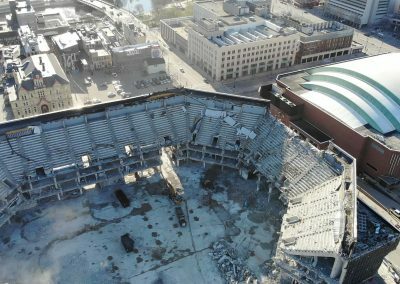 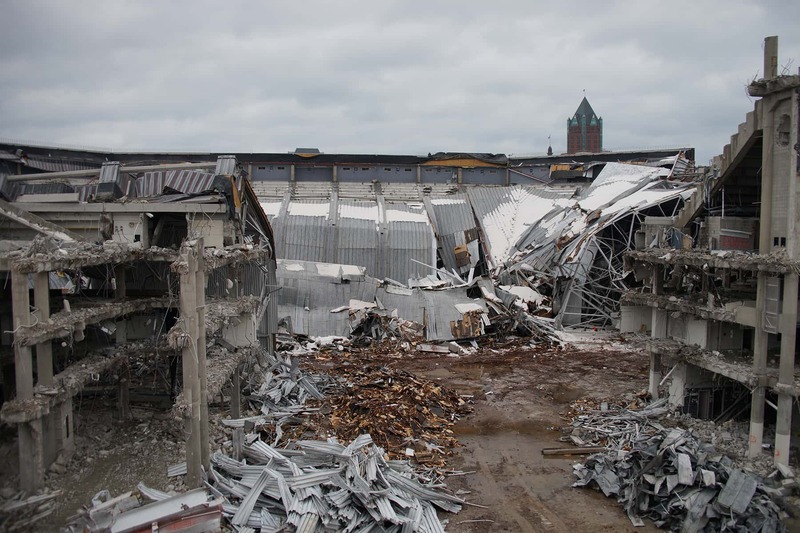 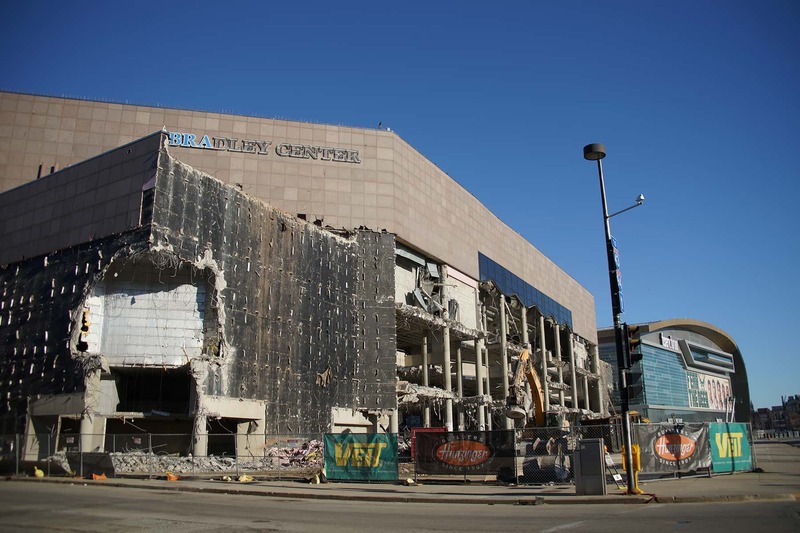 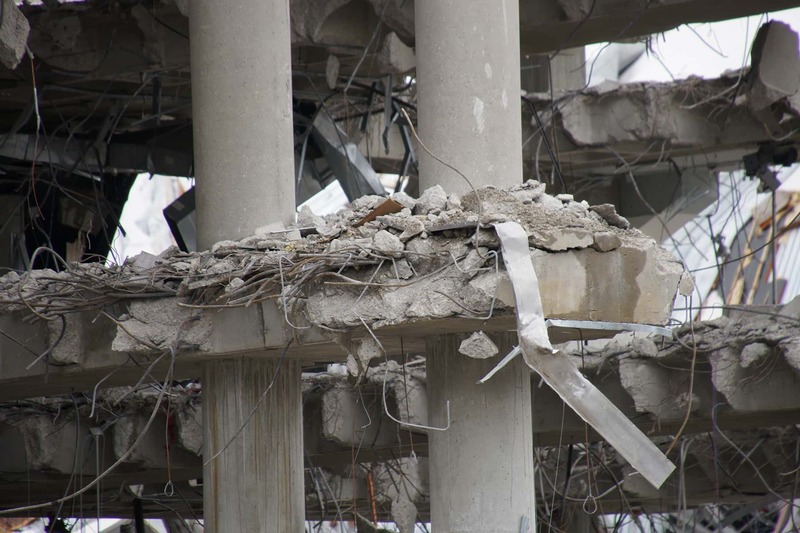 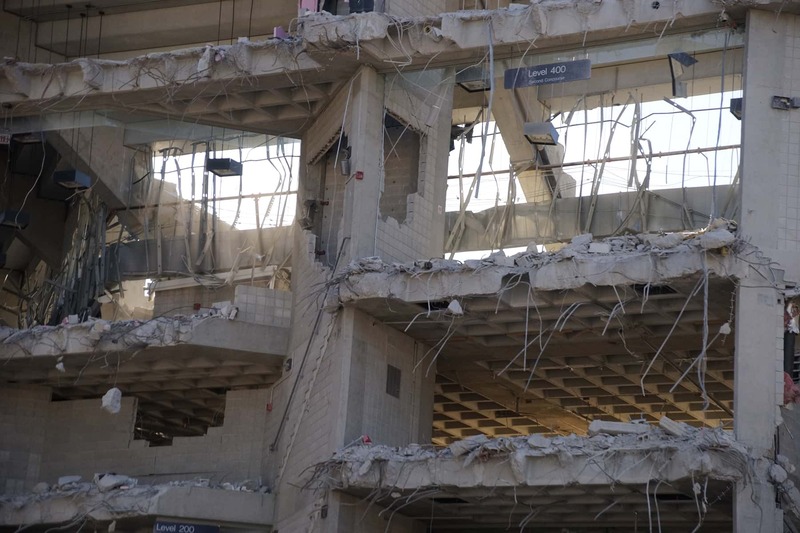 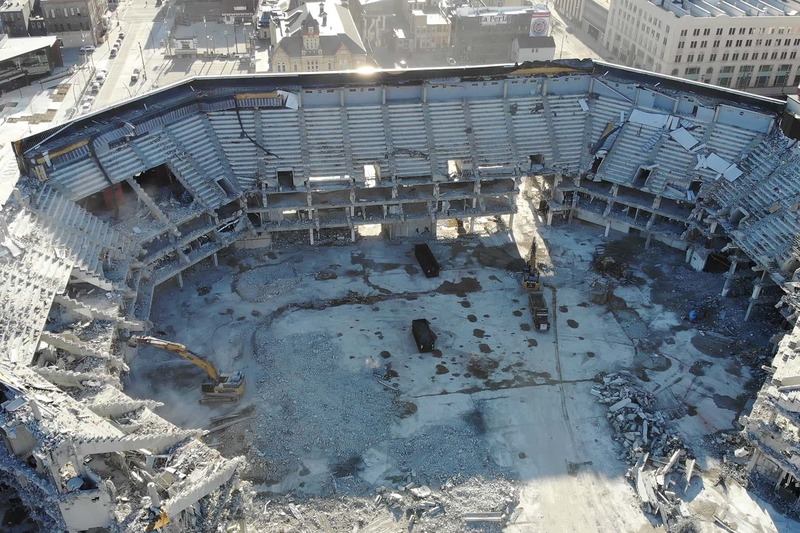 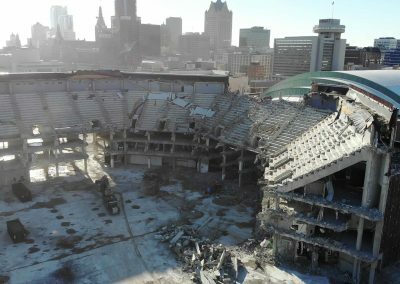 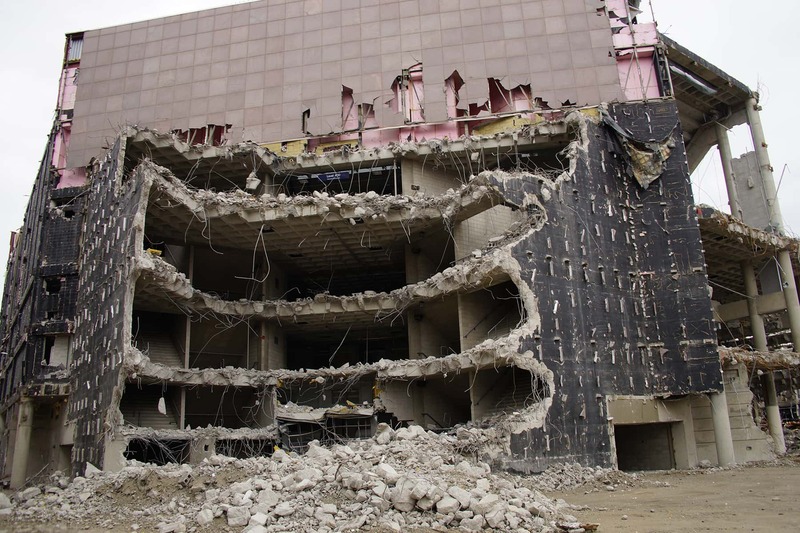 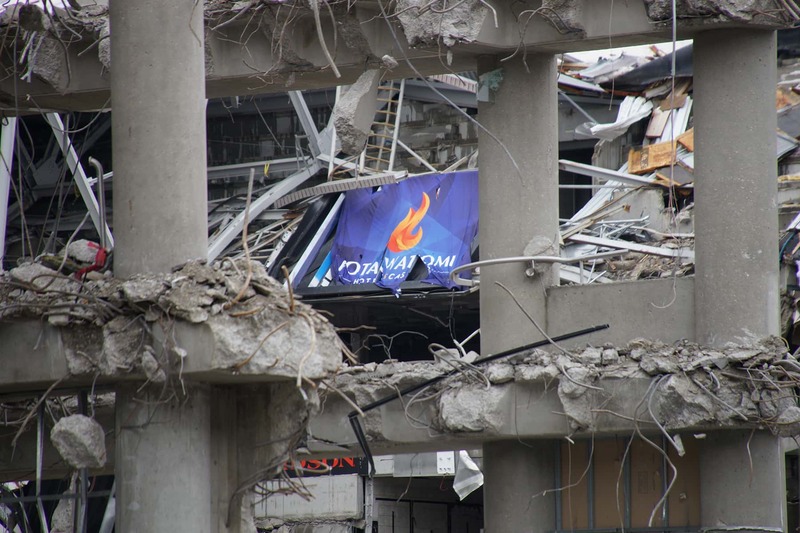 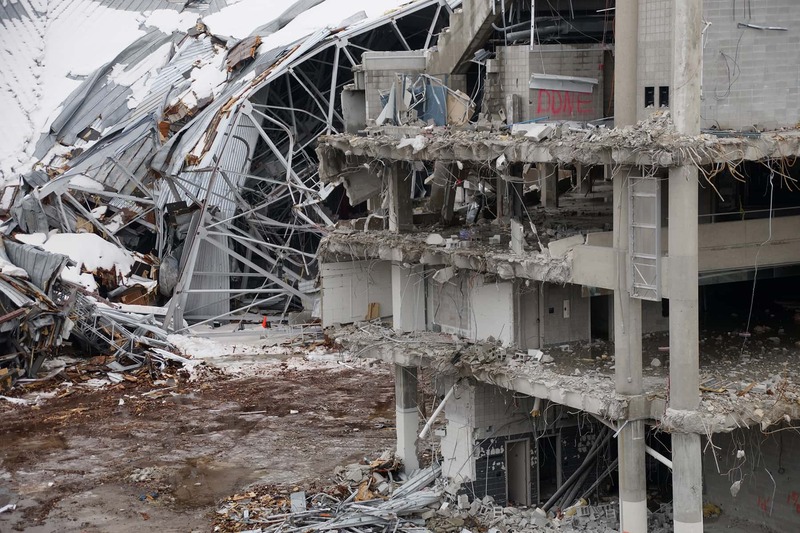 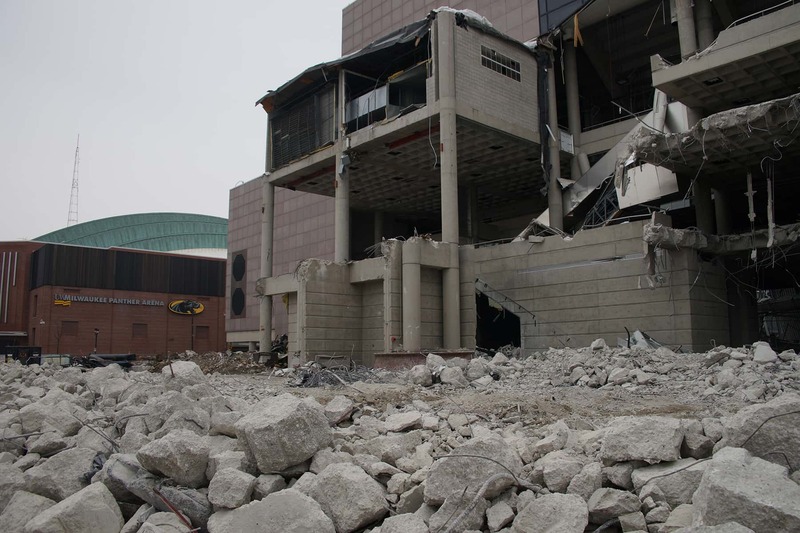 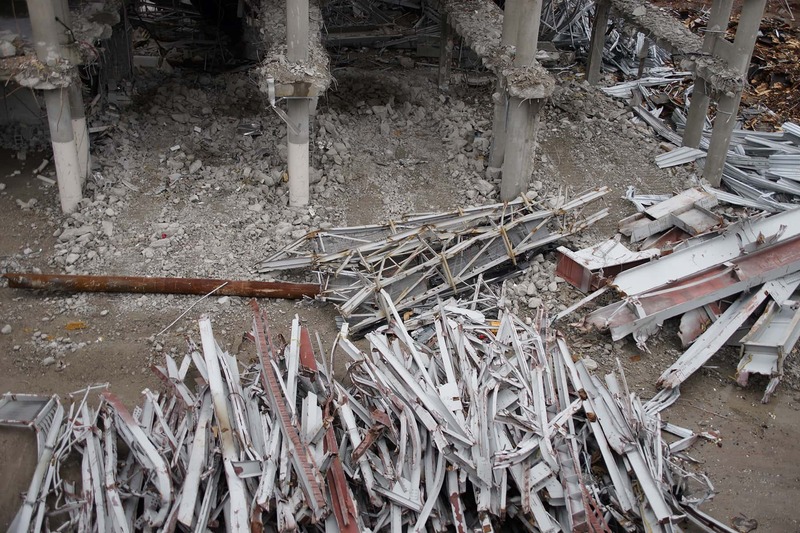 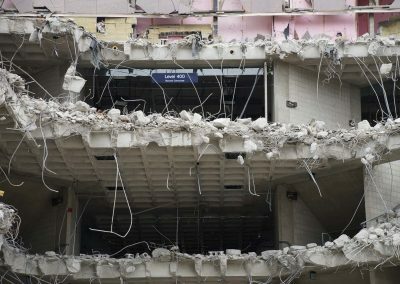 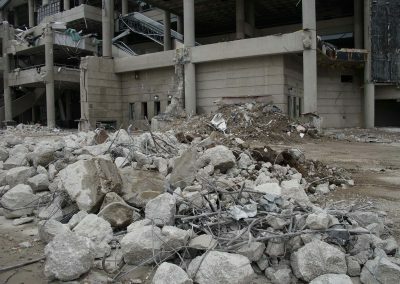 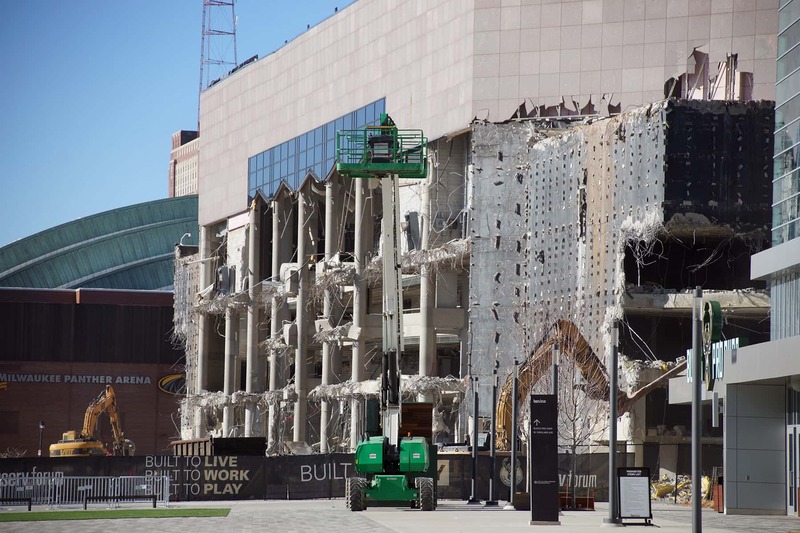 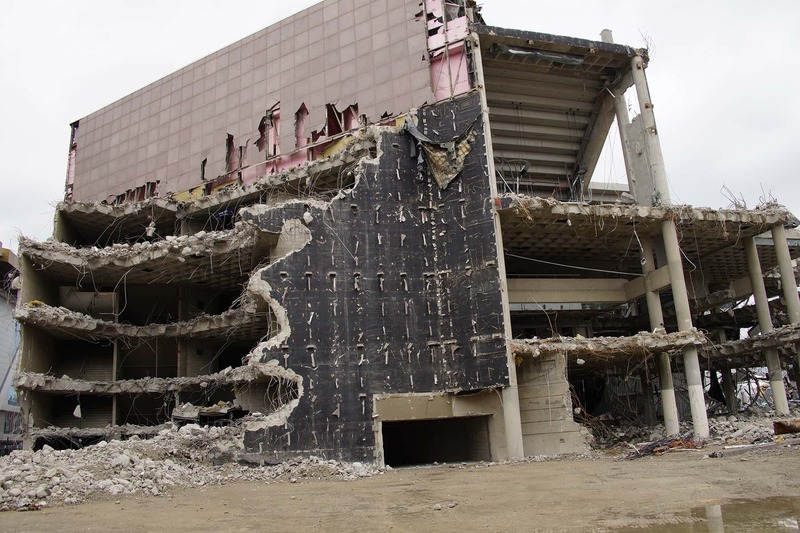 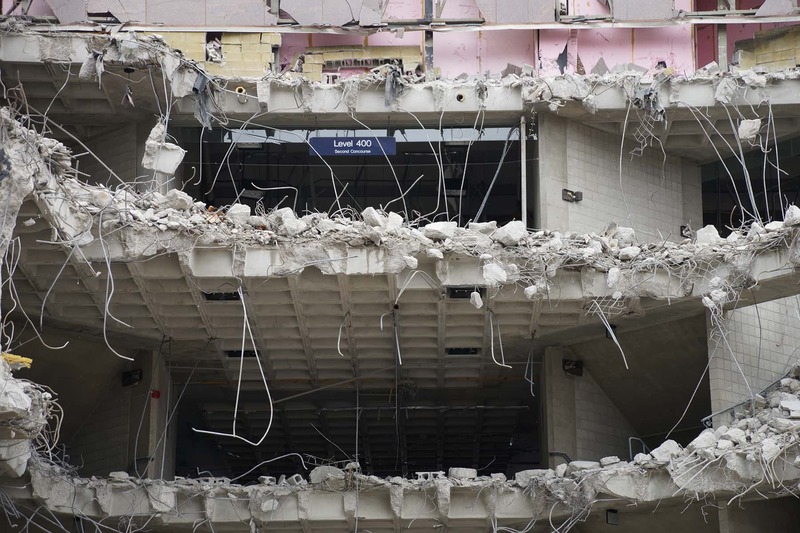 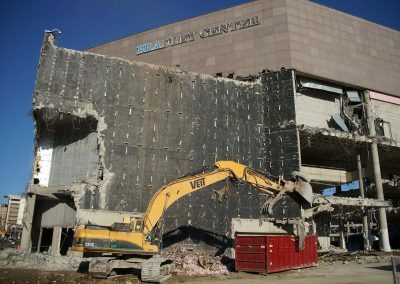 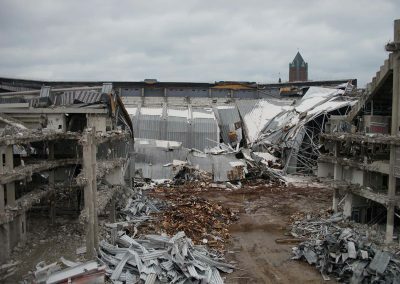 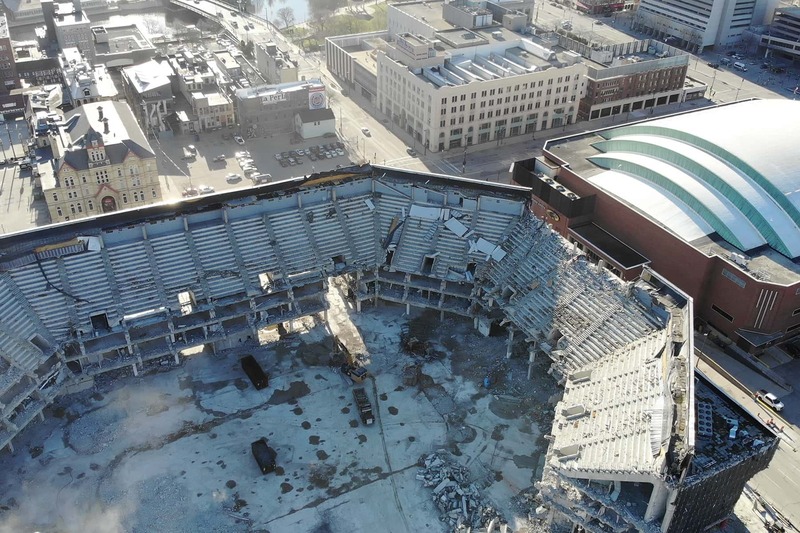 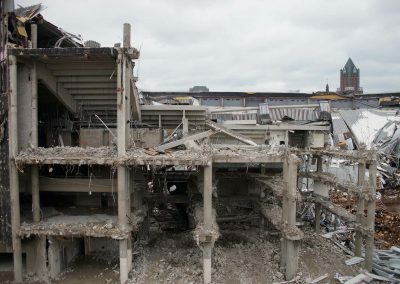 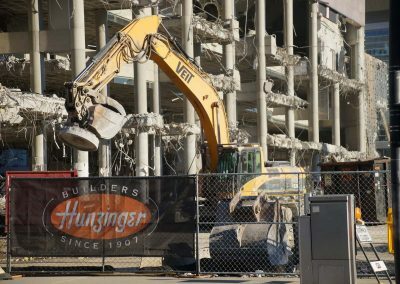 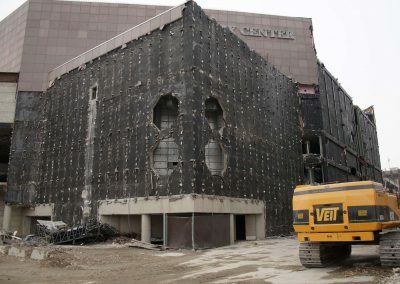 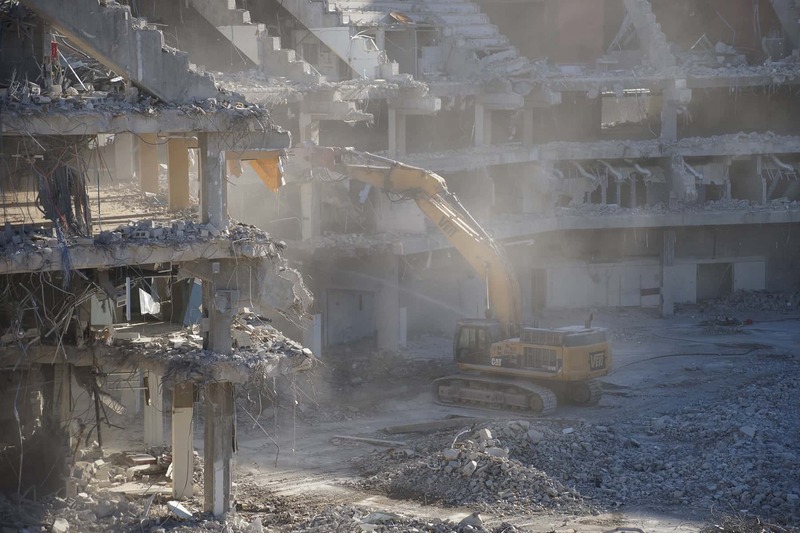 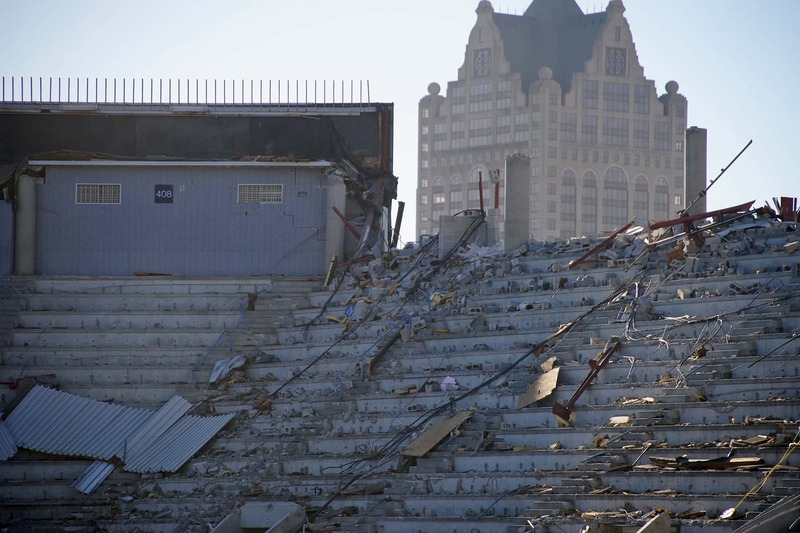 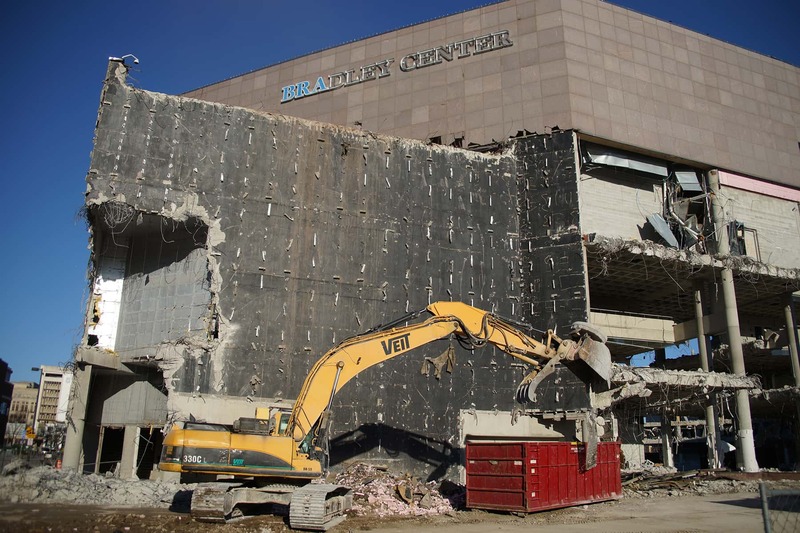 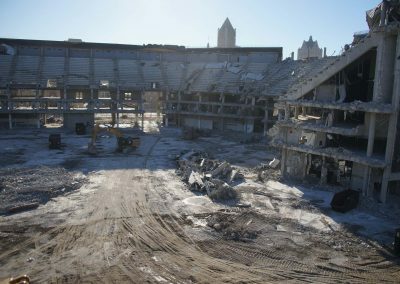 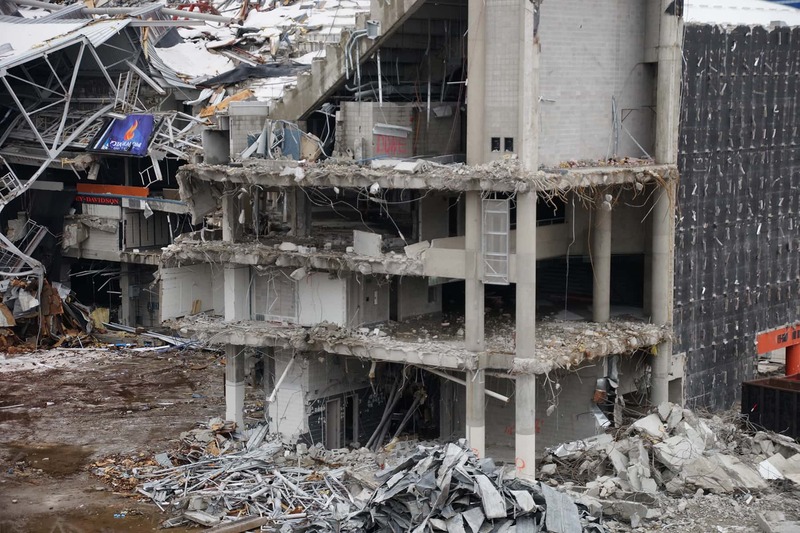 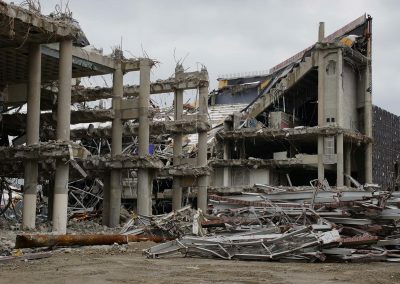 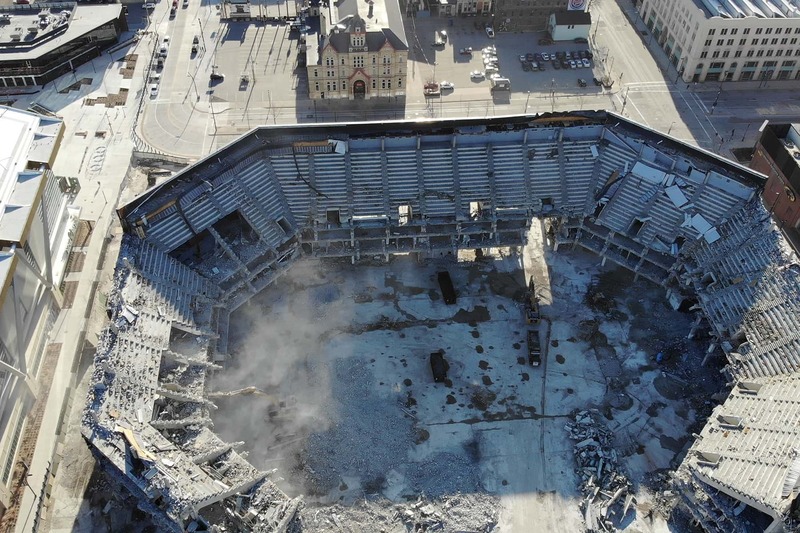 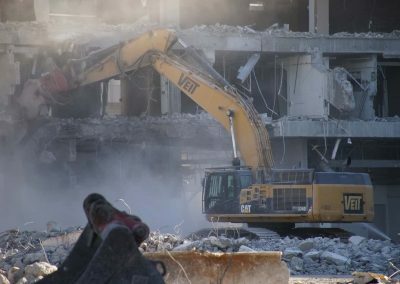 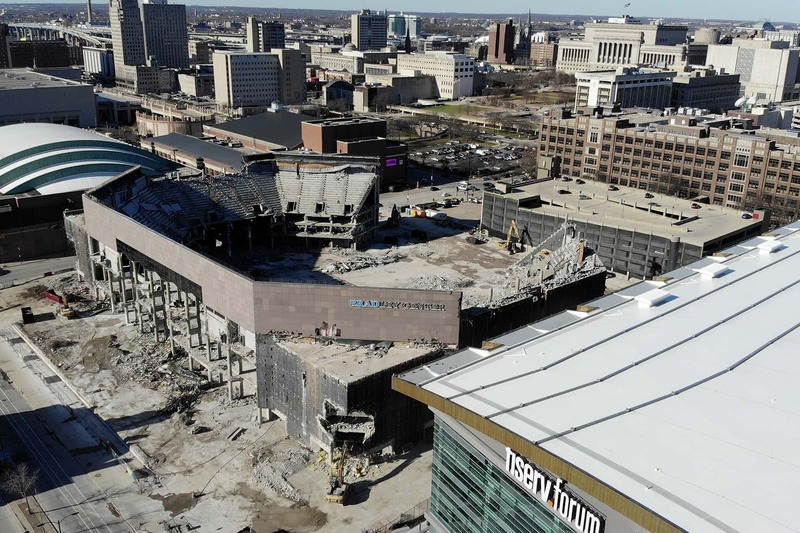 For 30 years, concert bands raised the roof at the Bradley Center but demolition crews razed the roof in 30 seconds. 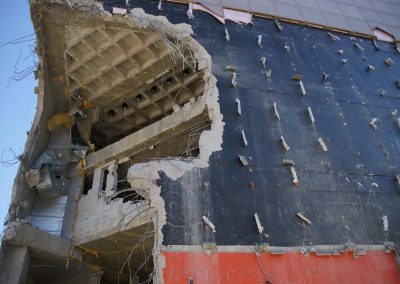 The superstructure was “lowered” by explosives, to speed the deconstruction process and minimize risks to crews working on the project. 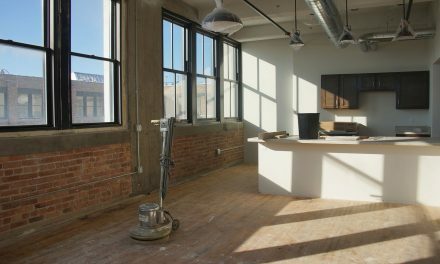 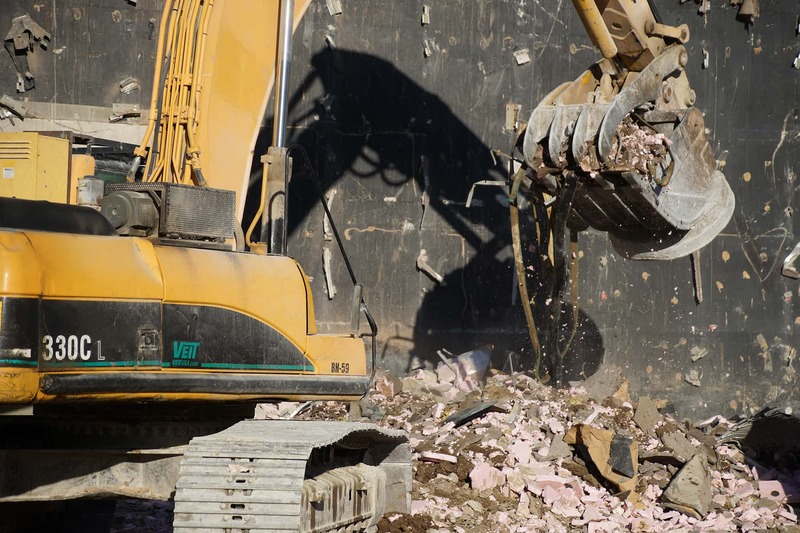 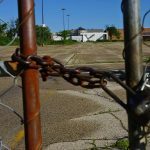 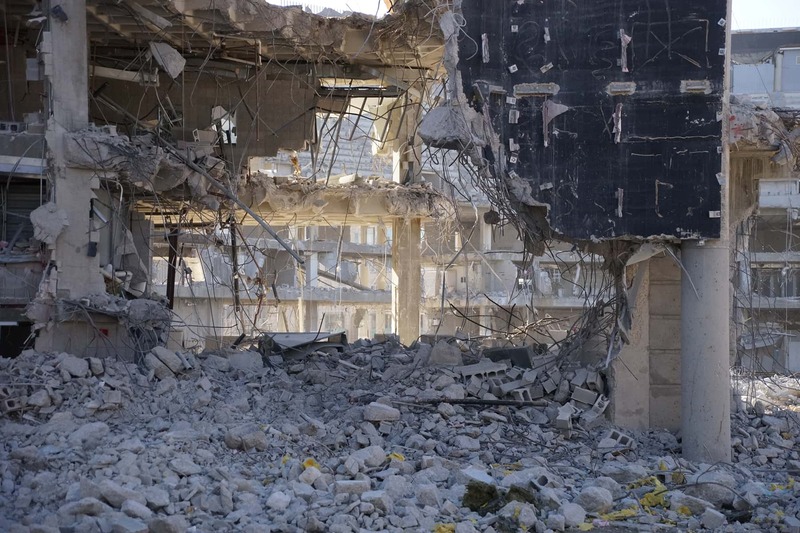 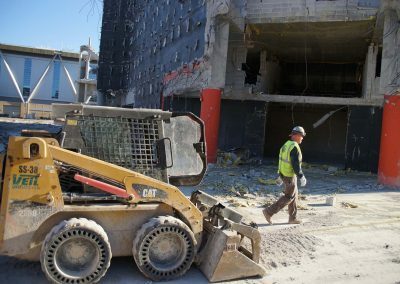 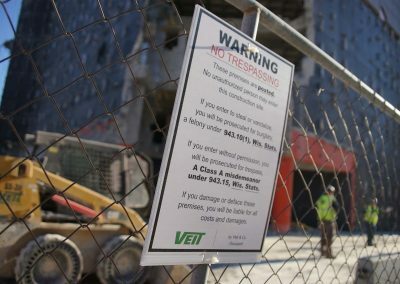 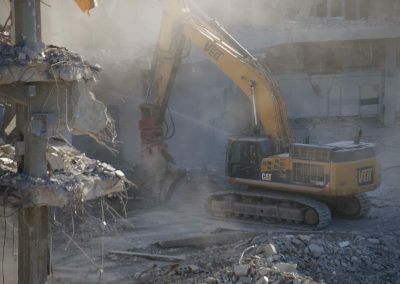 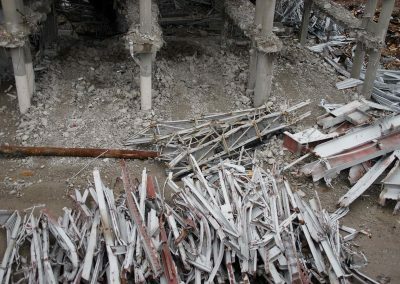 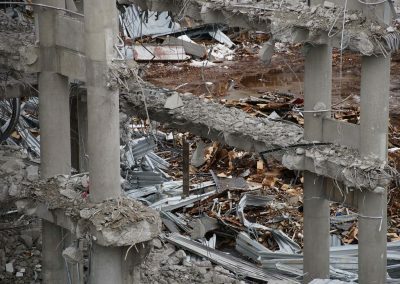 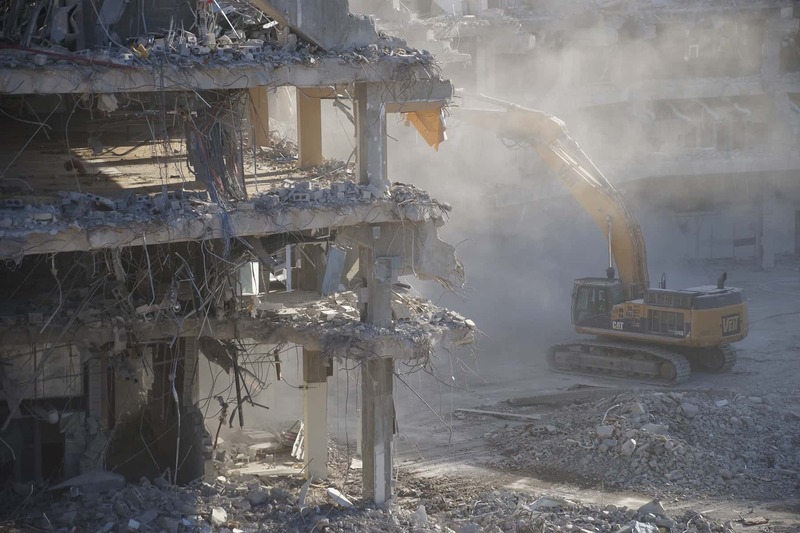 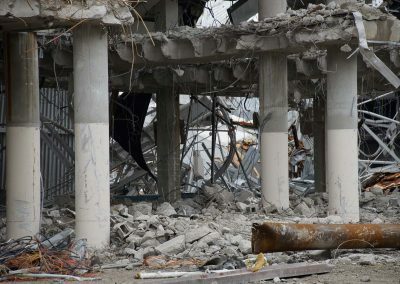 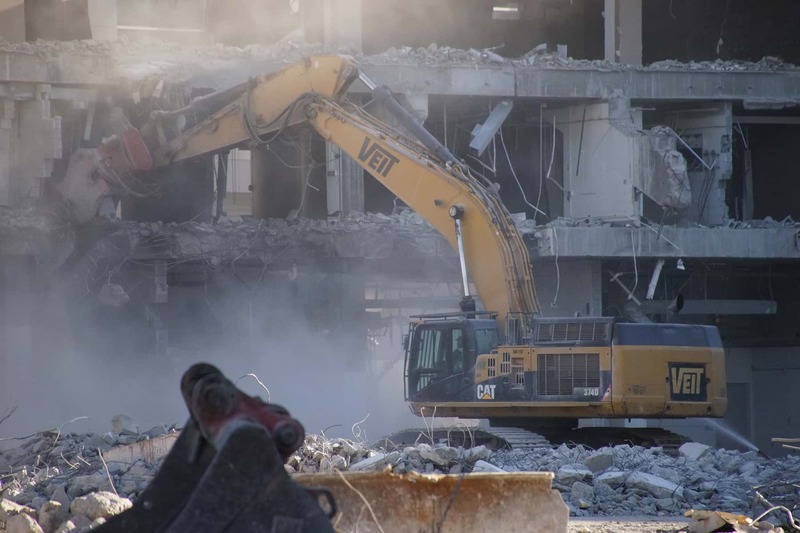 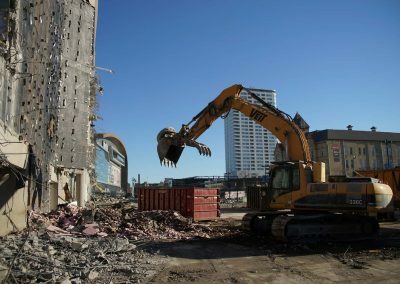 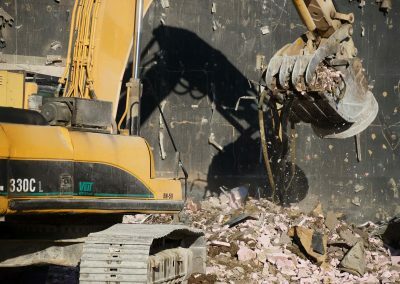 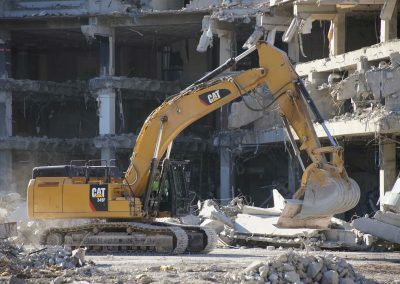 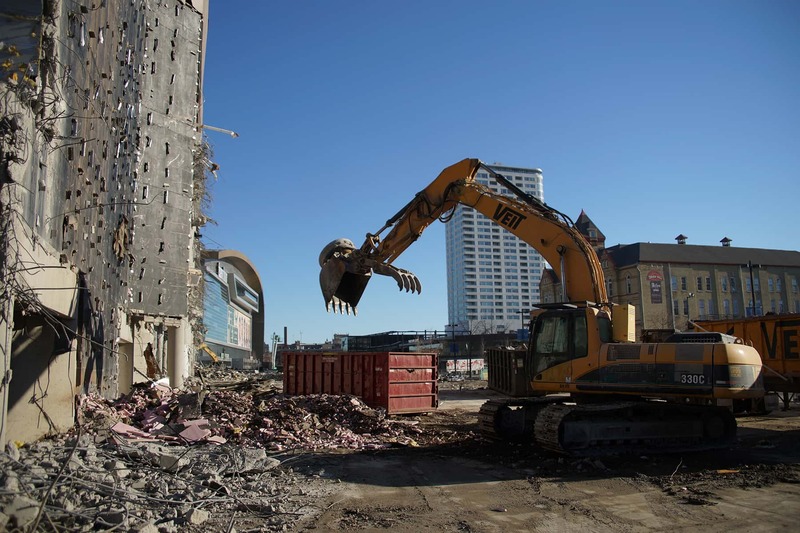 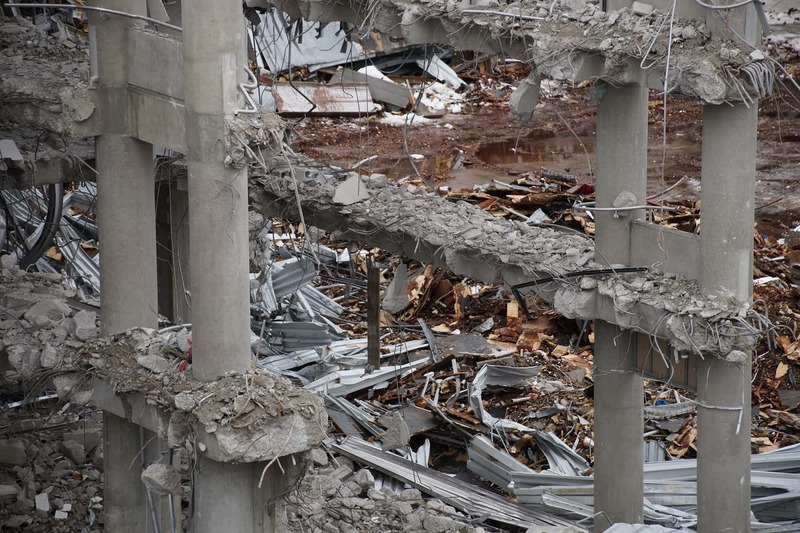 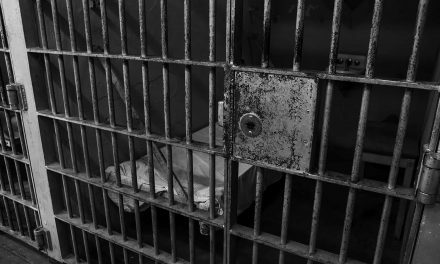 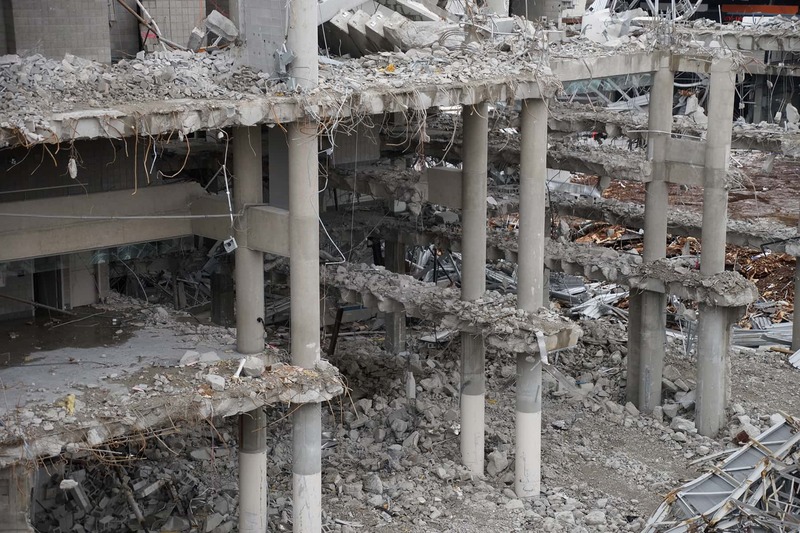 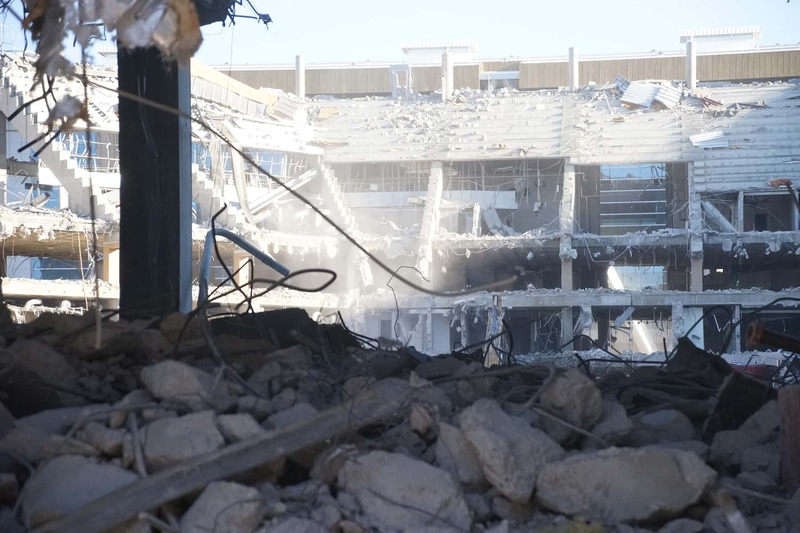 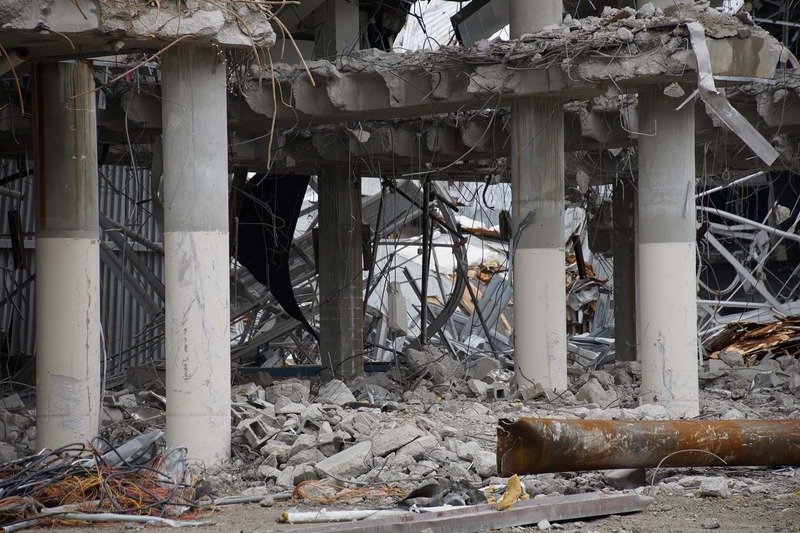 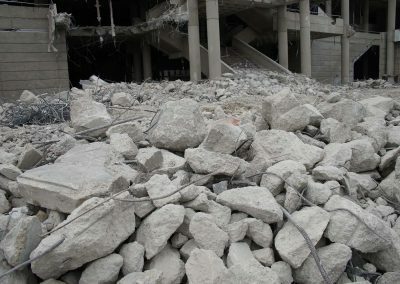 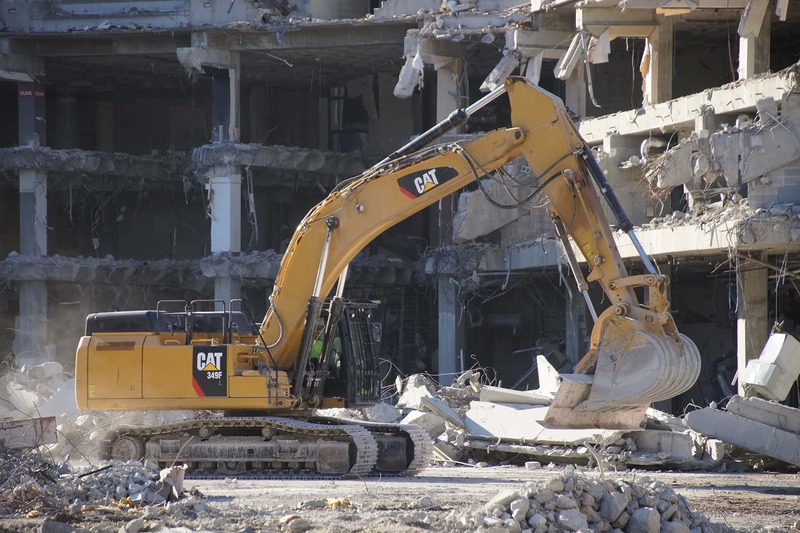 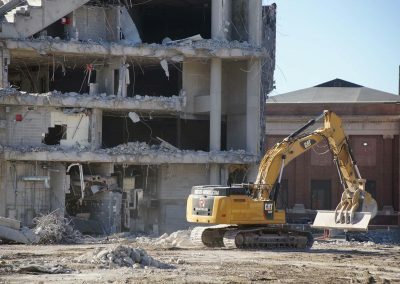 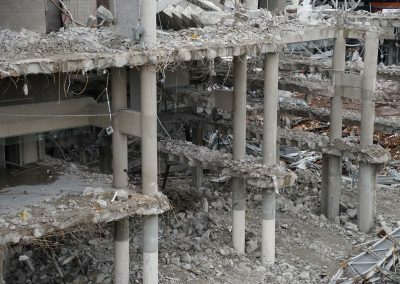 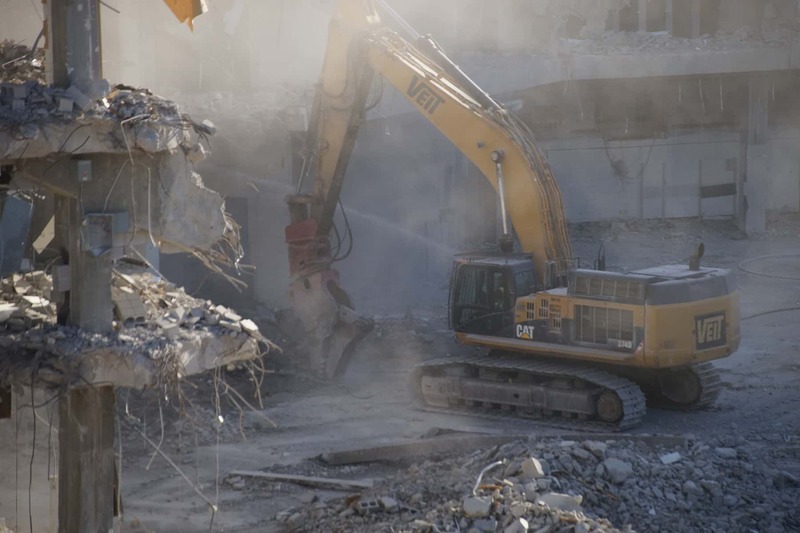 The 7.2-acre site is expected to be cleared by the summer, with crews chipping away at its form and hauling off the bits. 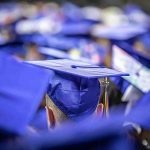 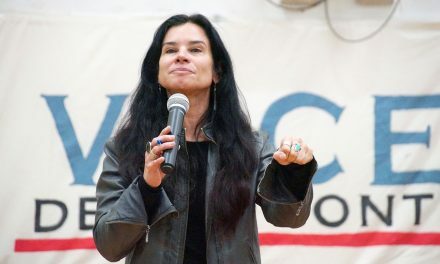 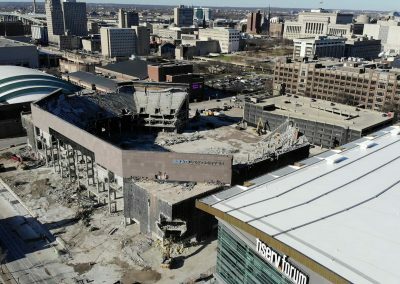 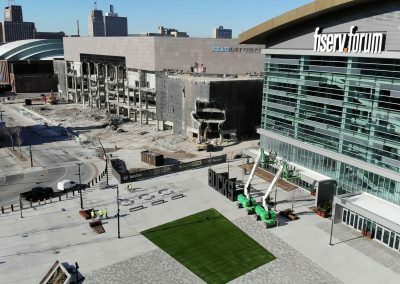 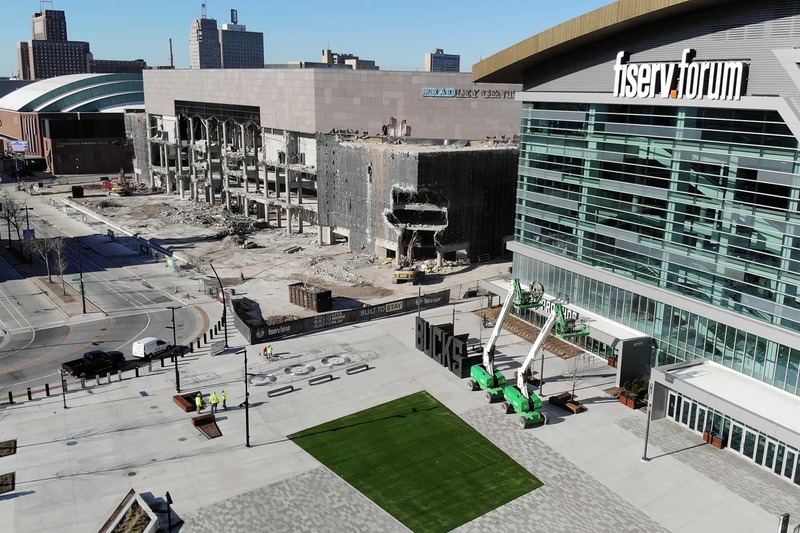 On April 12, Governor Tony Evers praised the legacy of the Bradley Center and the vision of Jane Bradley Pettit as the Bradley Center Sports and Entertainment Corporation (BCSEC) announced the completion of its business affairs and the transfer of remaining assets totaling $4.29 million to the state of Wisconsin. 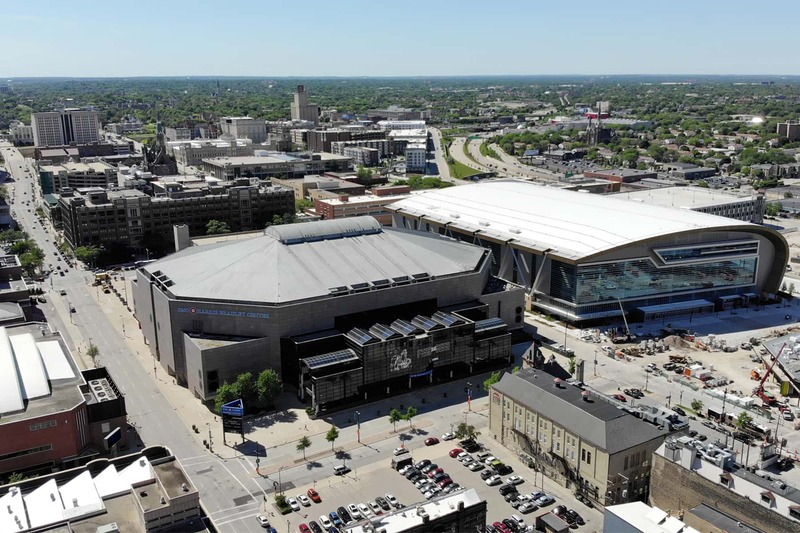 The BCSEC was created by the state to own and operate the Bradley Center on behalf of the people of Wisconsin. 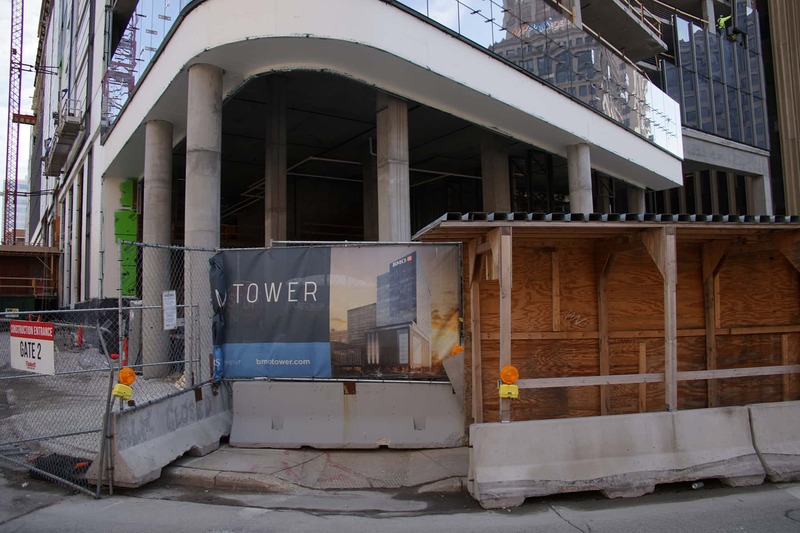 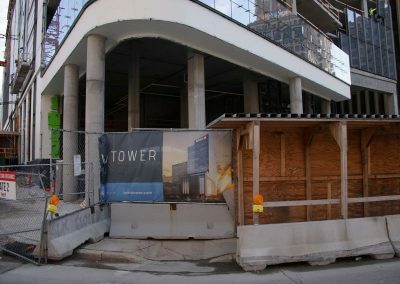 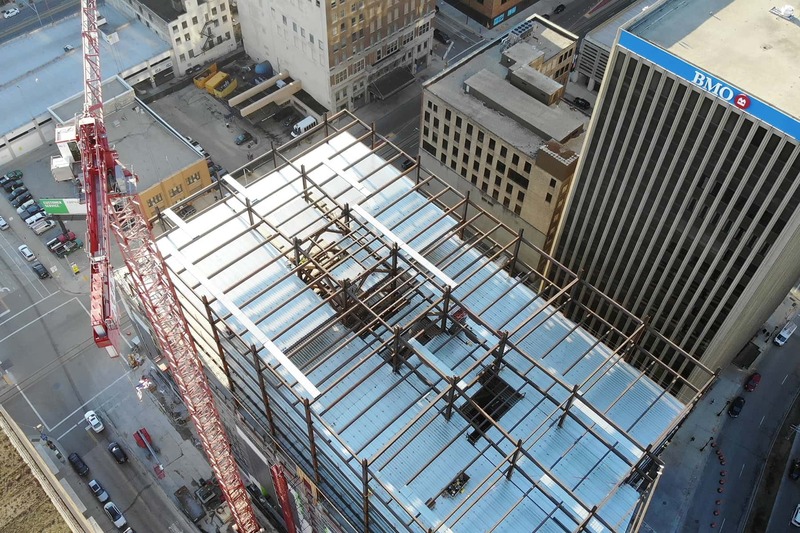 About 2,500 feet away, on the corner of Water and Wells Streets, the BMO Tower is filling out its 25-story footprint. 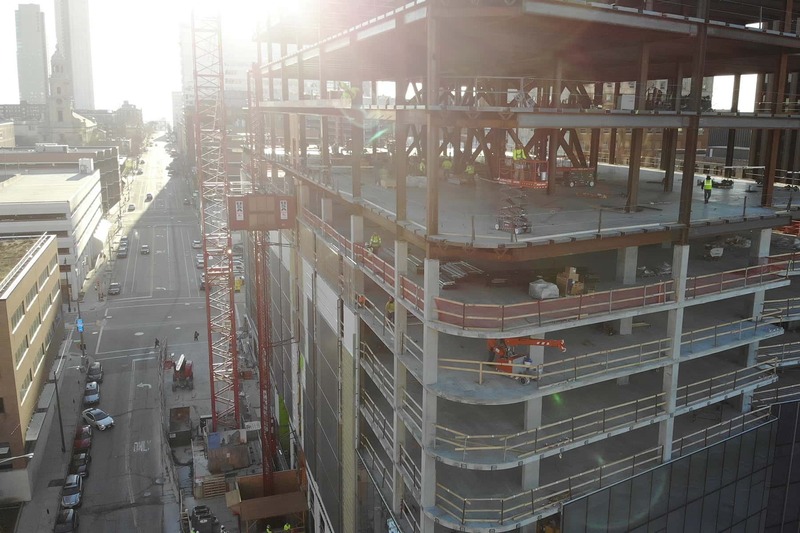 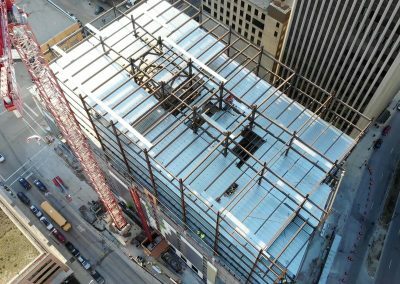 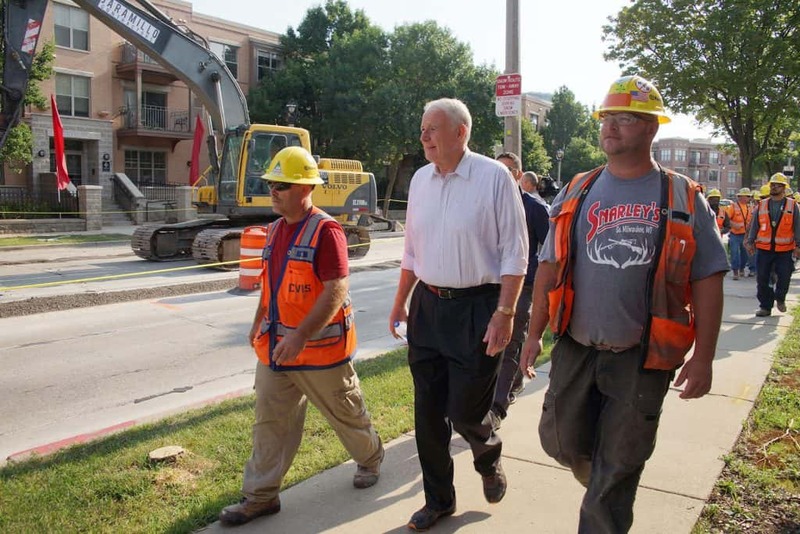 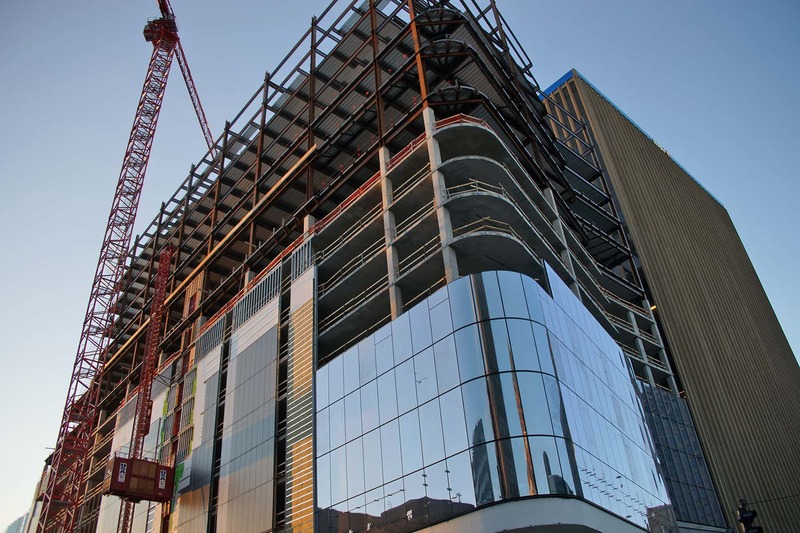 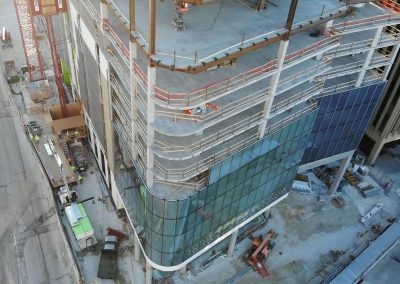 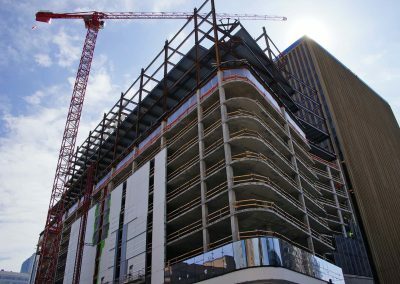 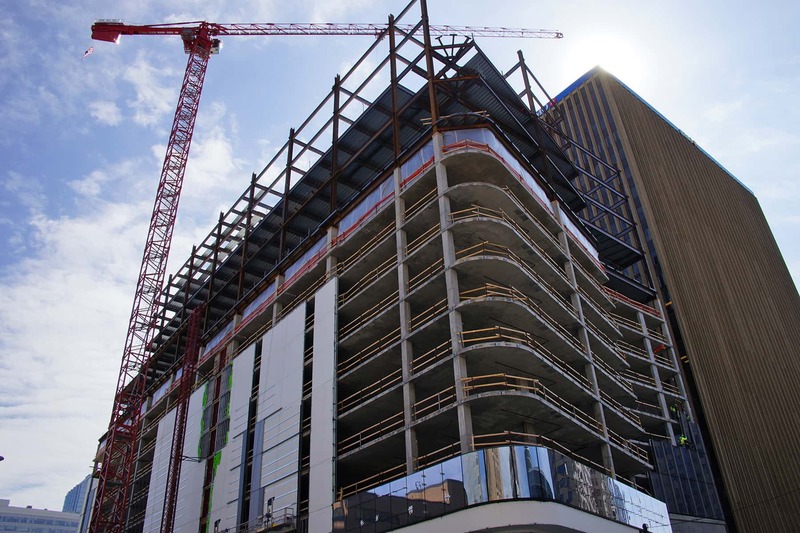 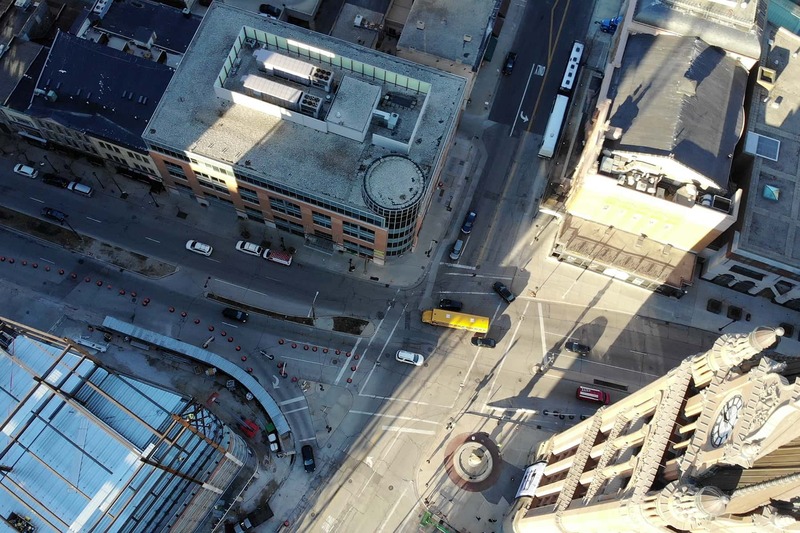 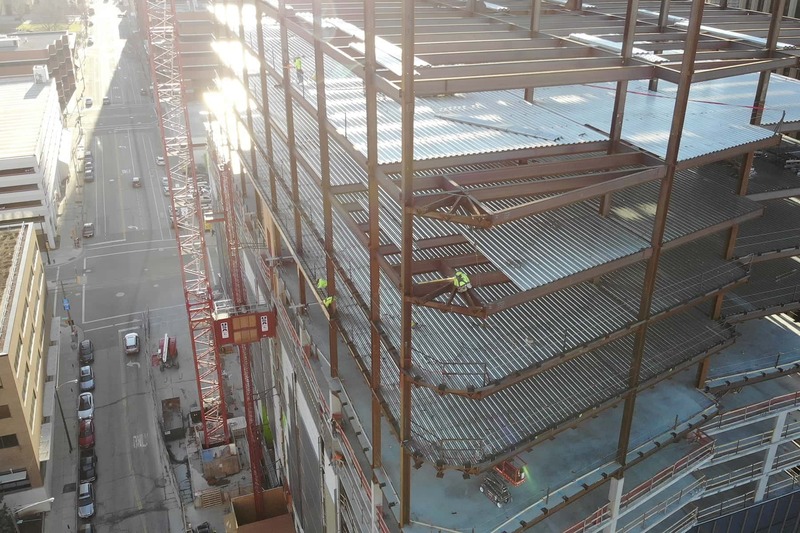 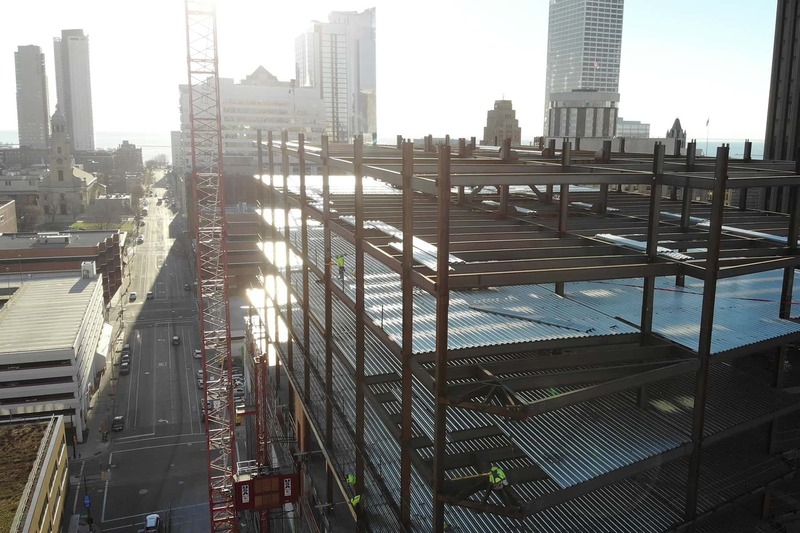 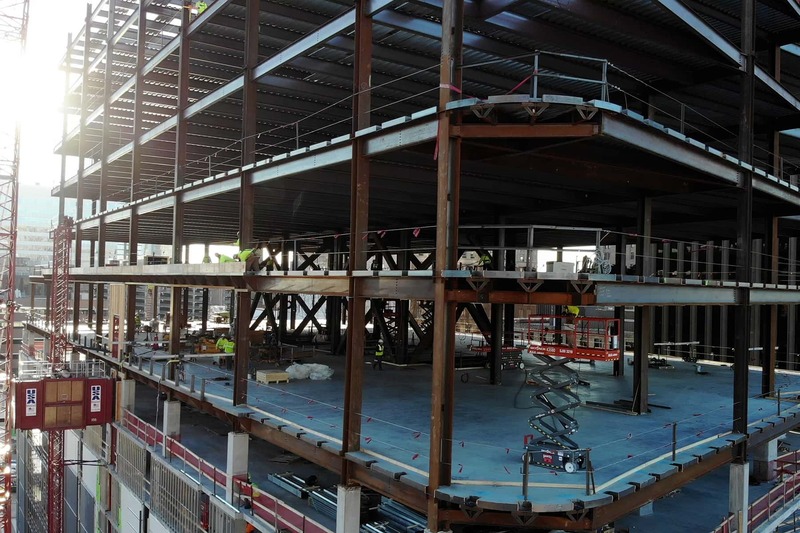 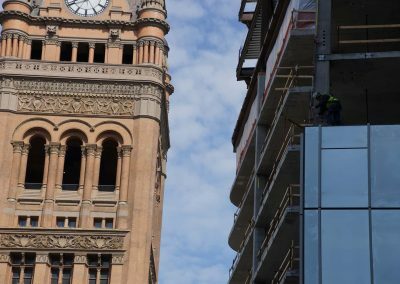 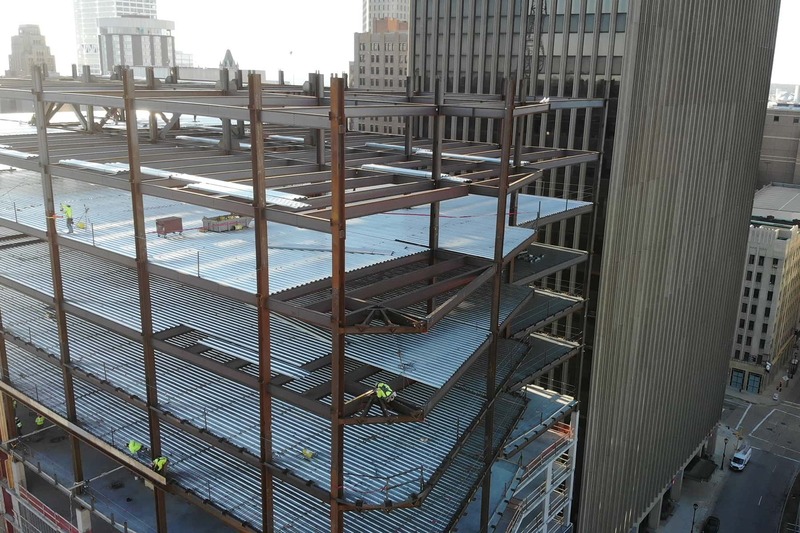 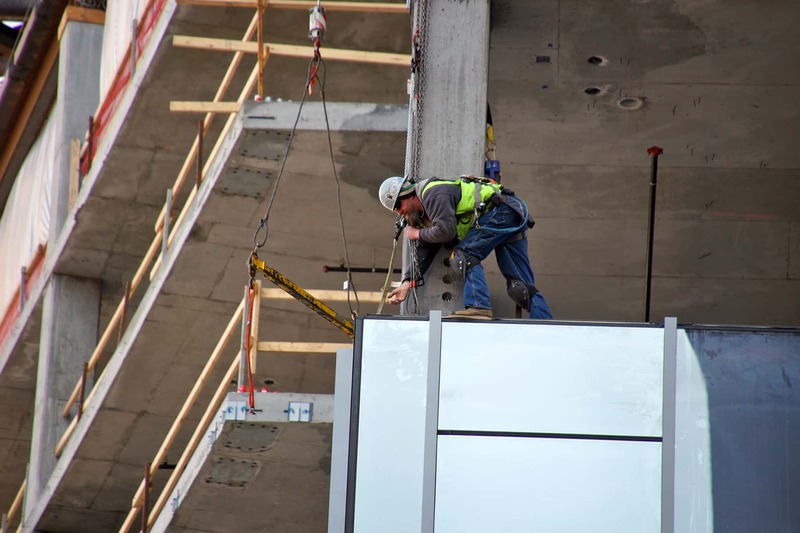 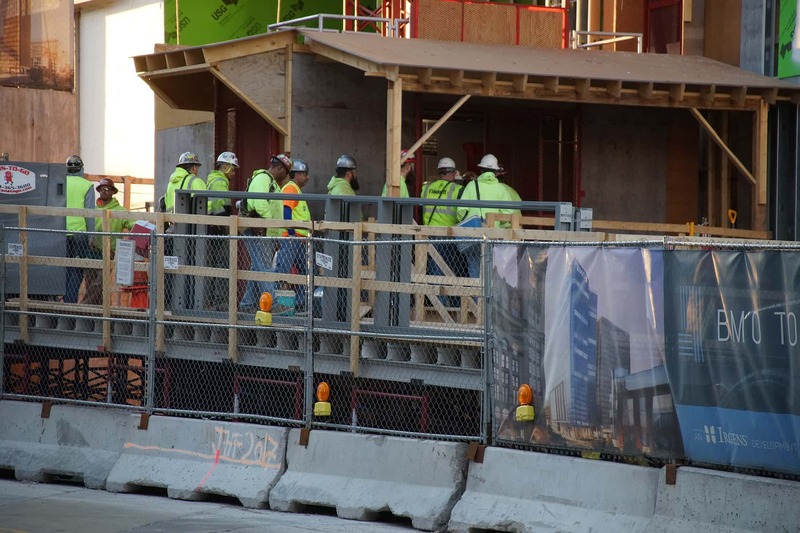 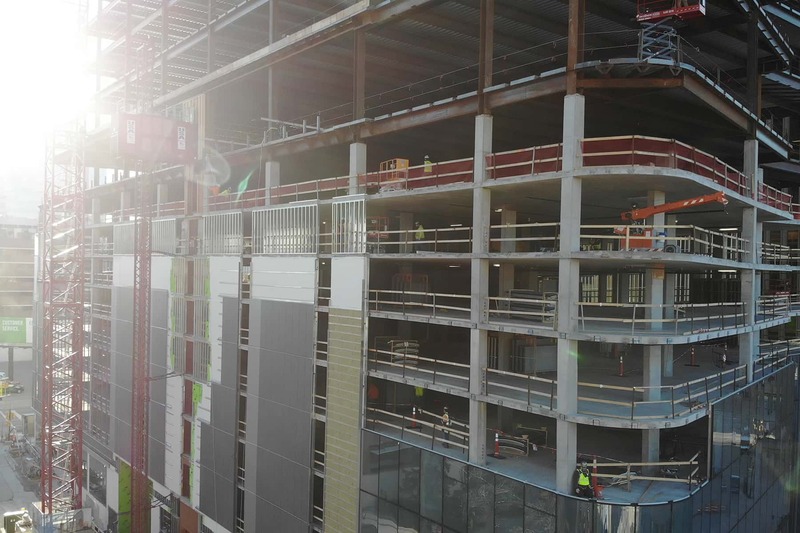 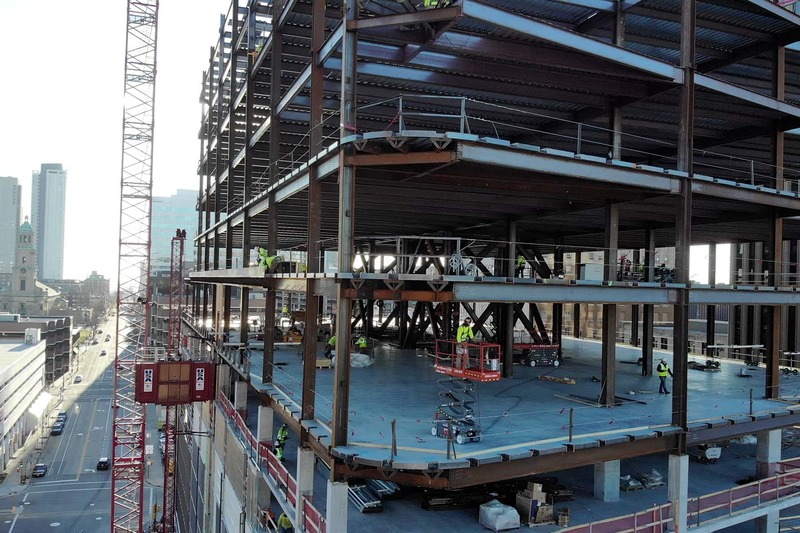 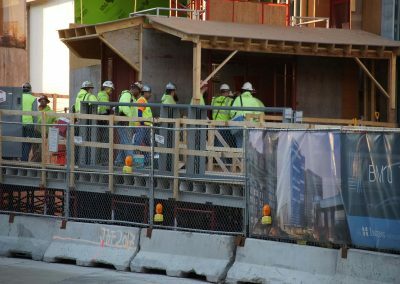 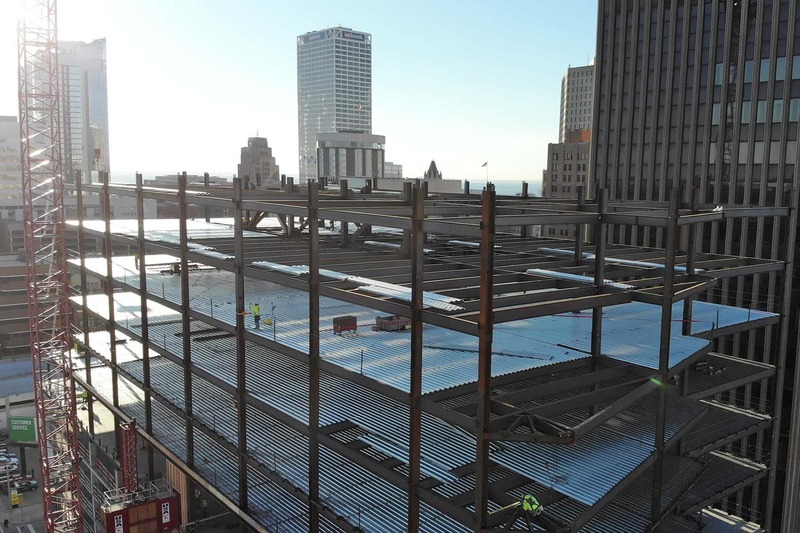 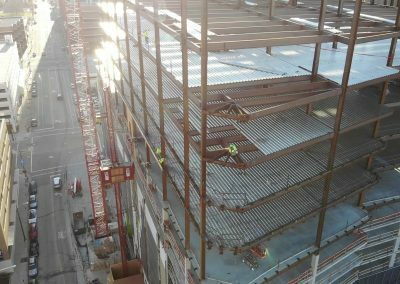 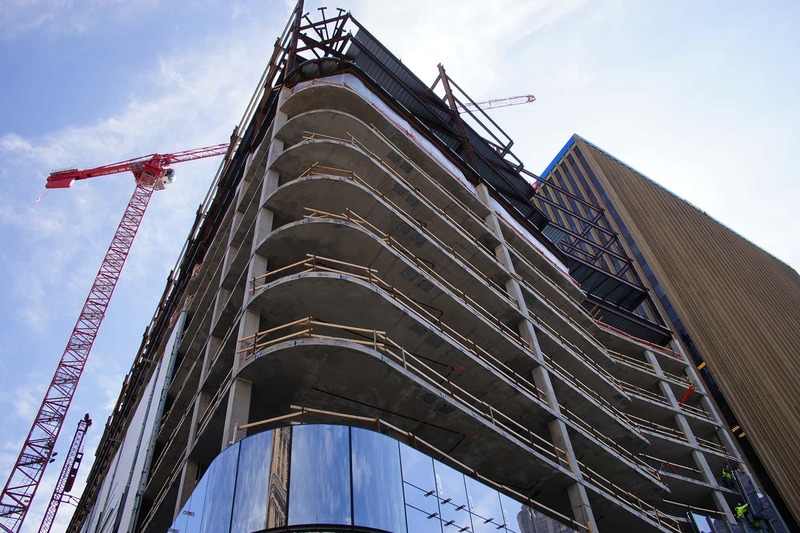 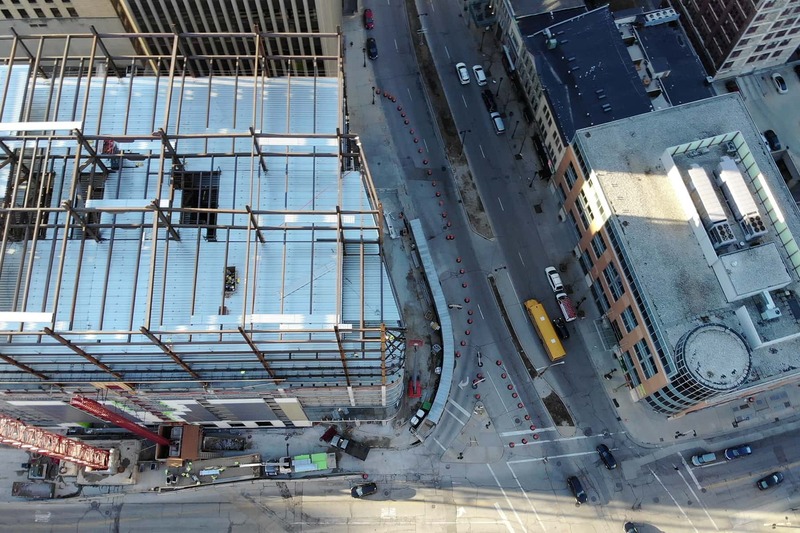 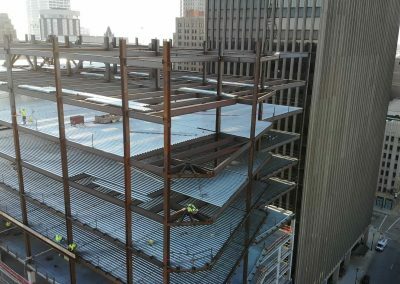 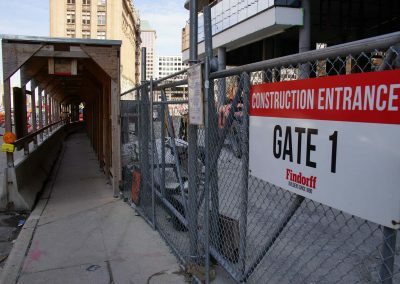 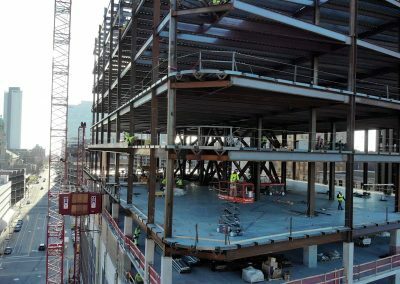 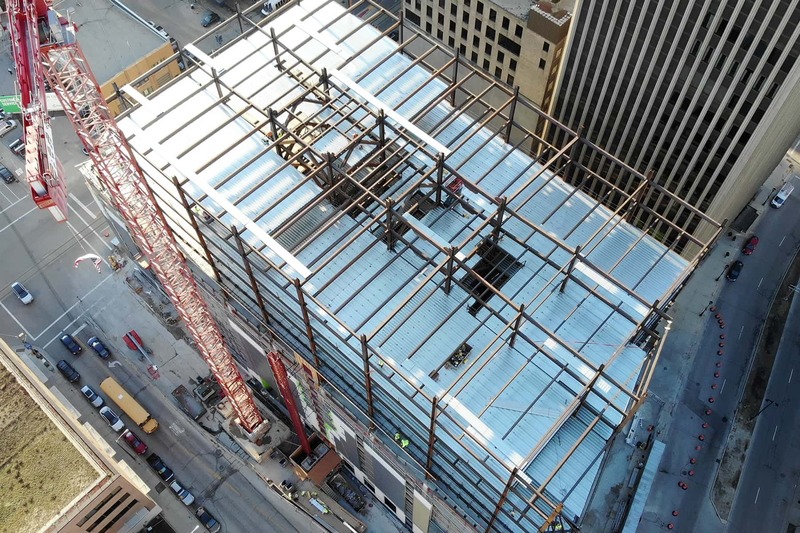 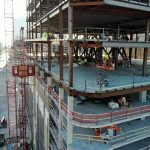 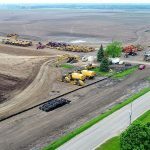 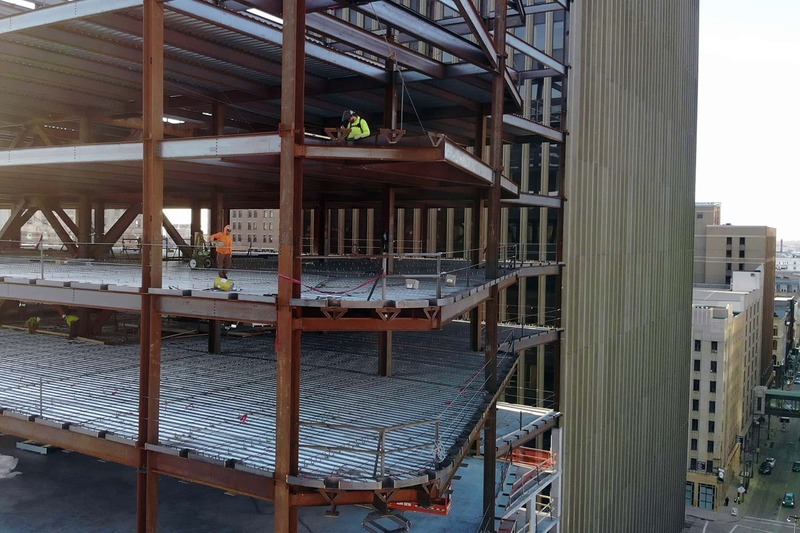 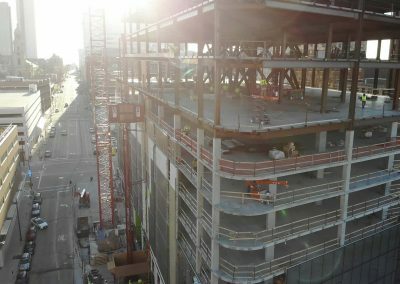 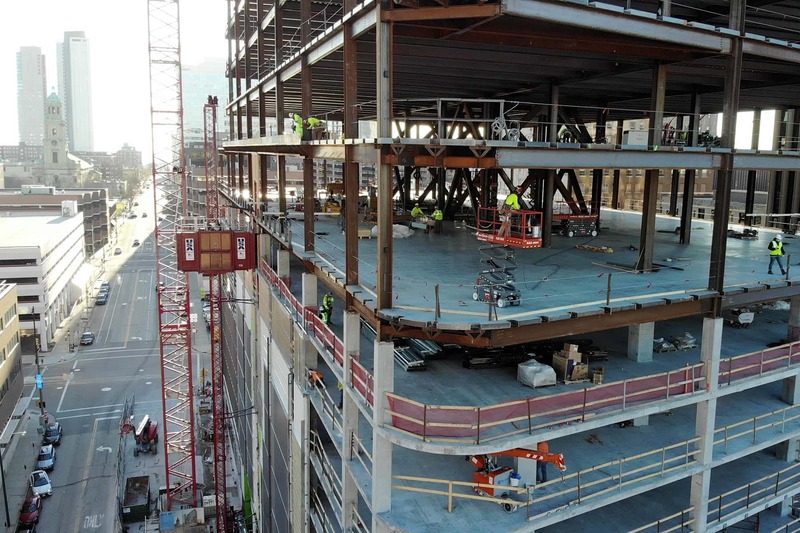 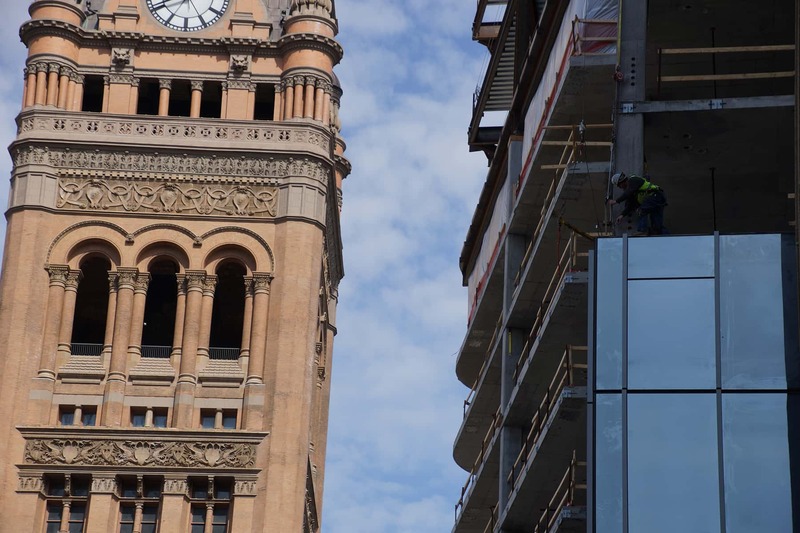 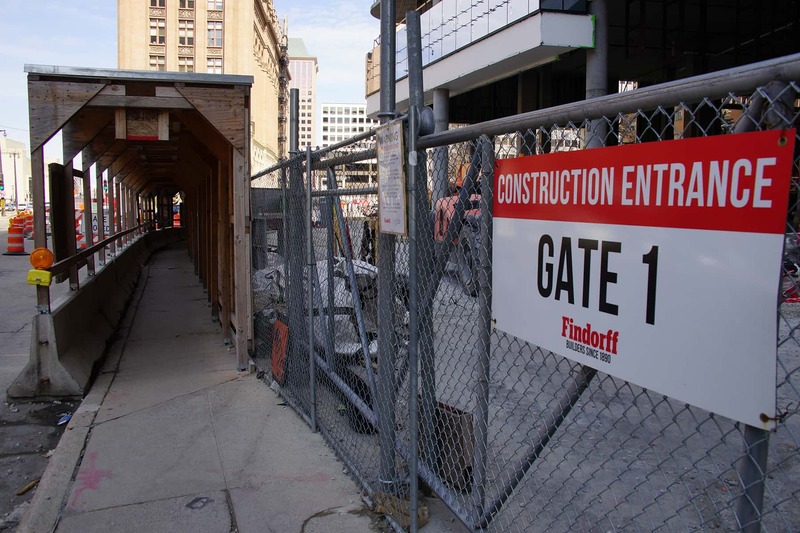 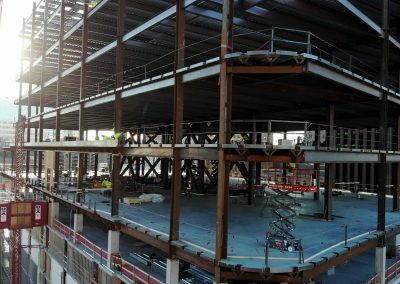 Construction formally kicked off on November 16, 2018, and the location will be home to BMO Harris Bank’s Wisconsin headquarters. 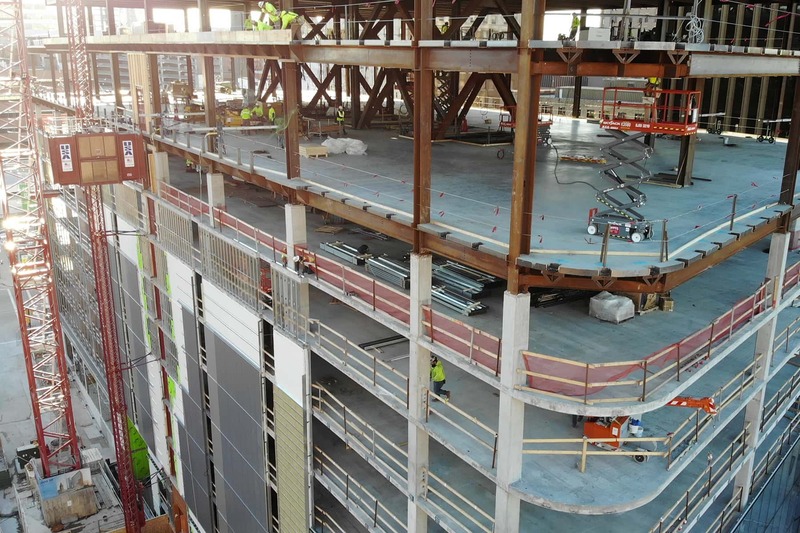 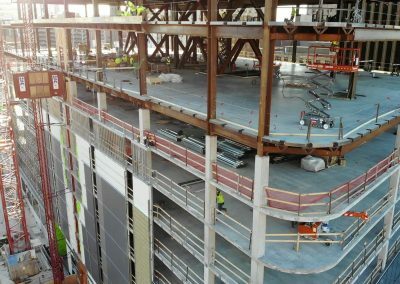 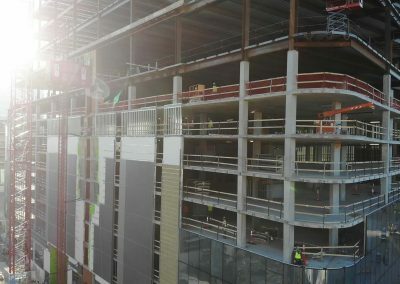 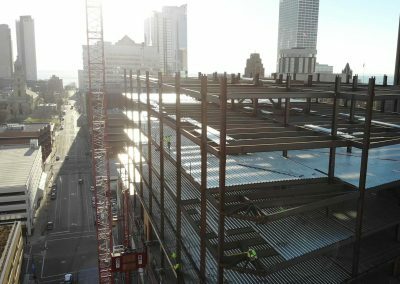 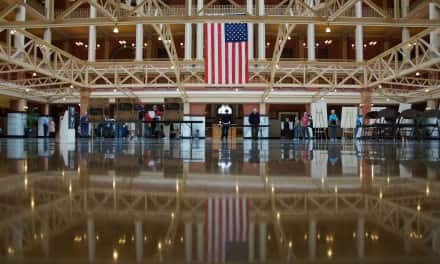 The 379,400-square-foot building and 647-stall parking lot is projected for completion in December 2019. 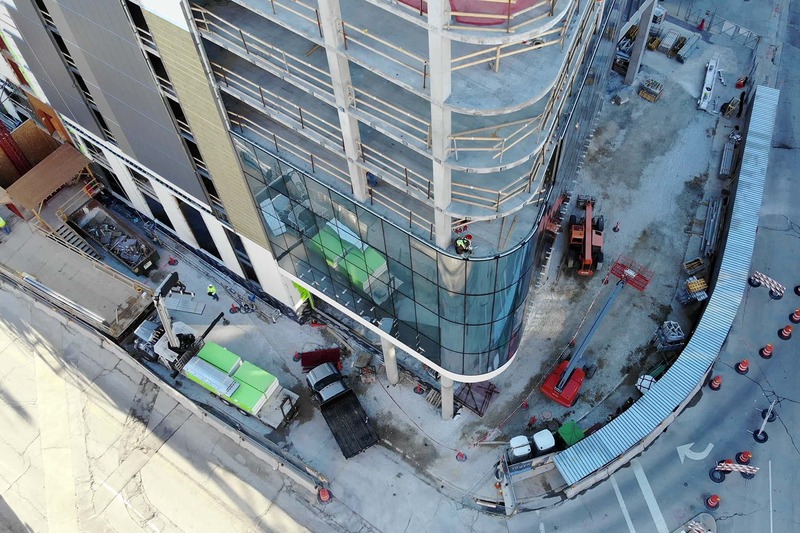 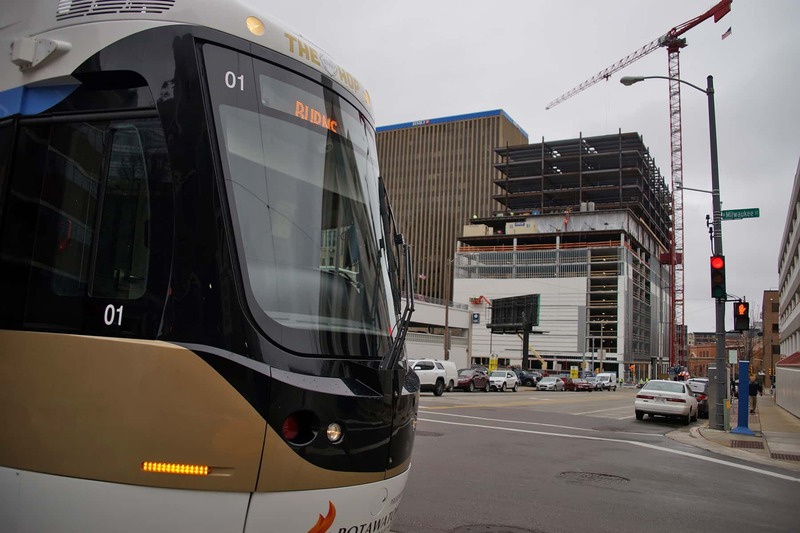 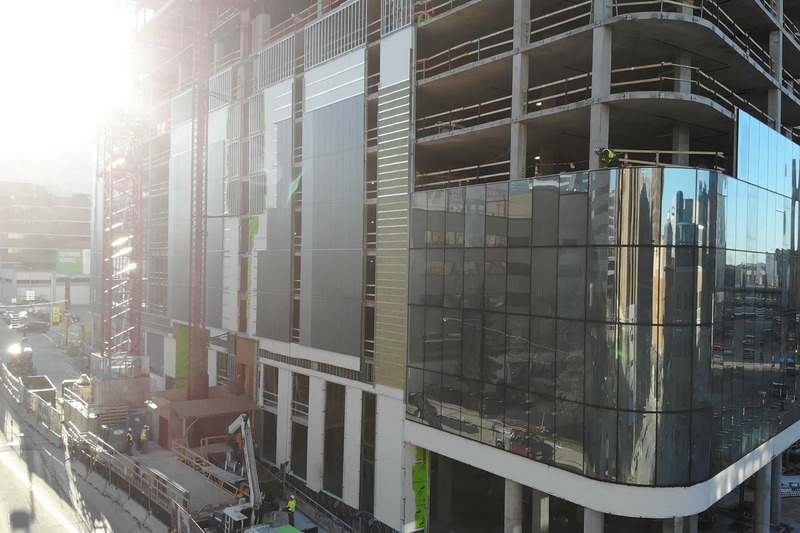 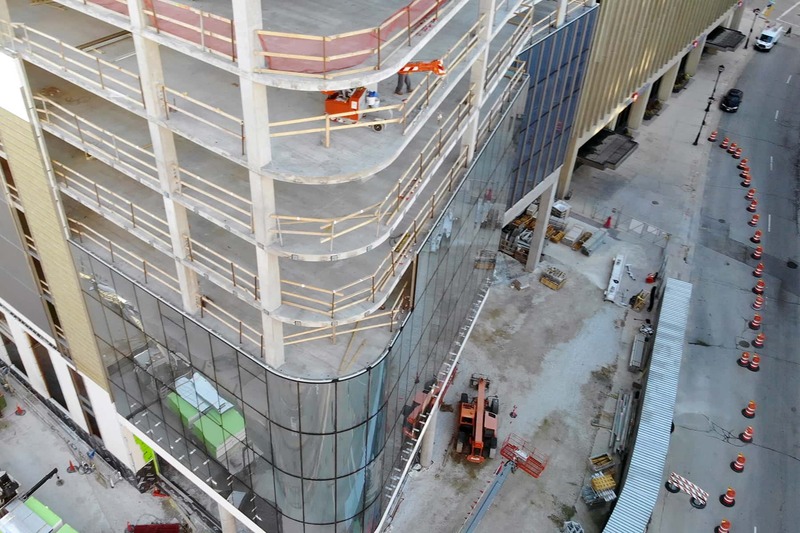 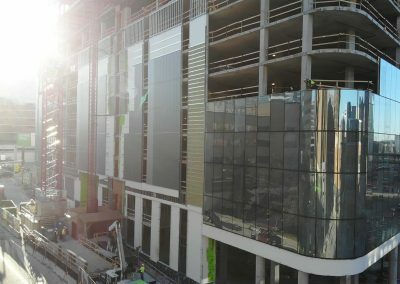 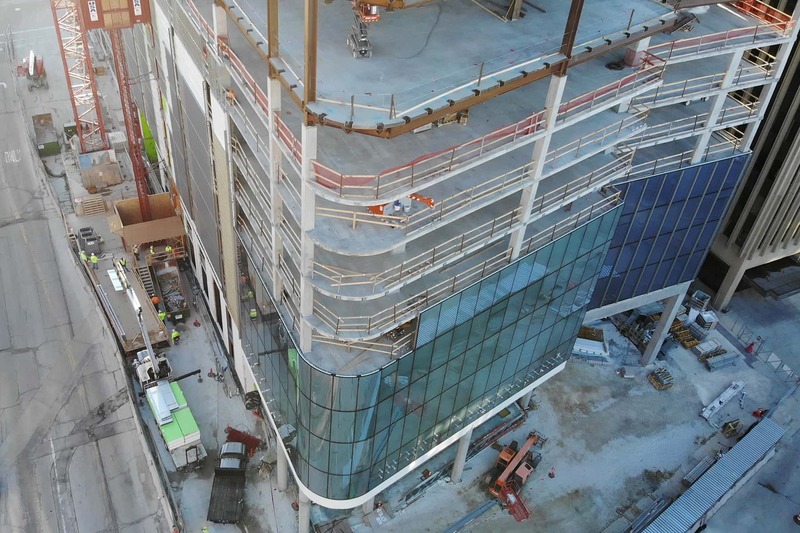 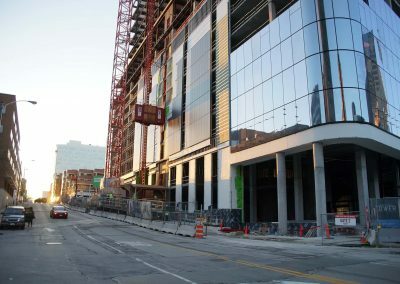 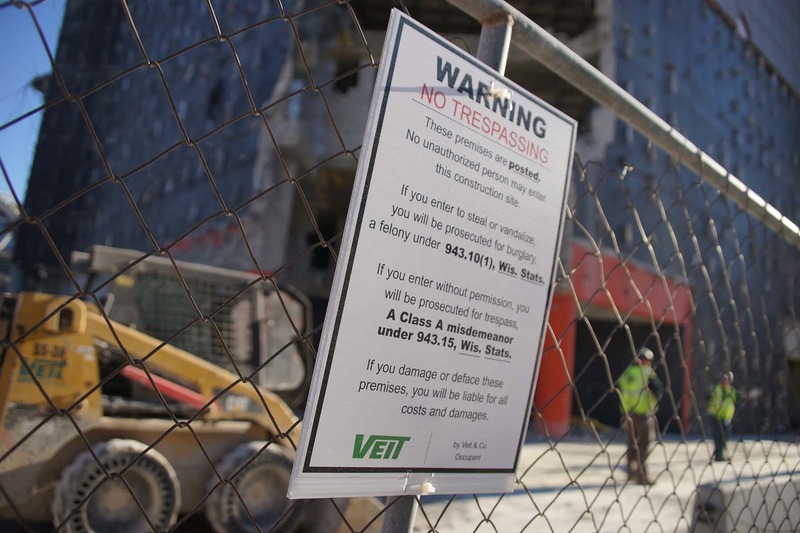 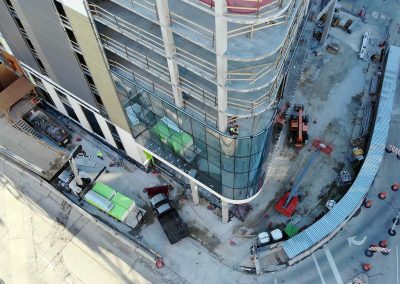 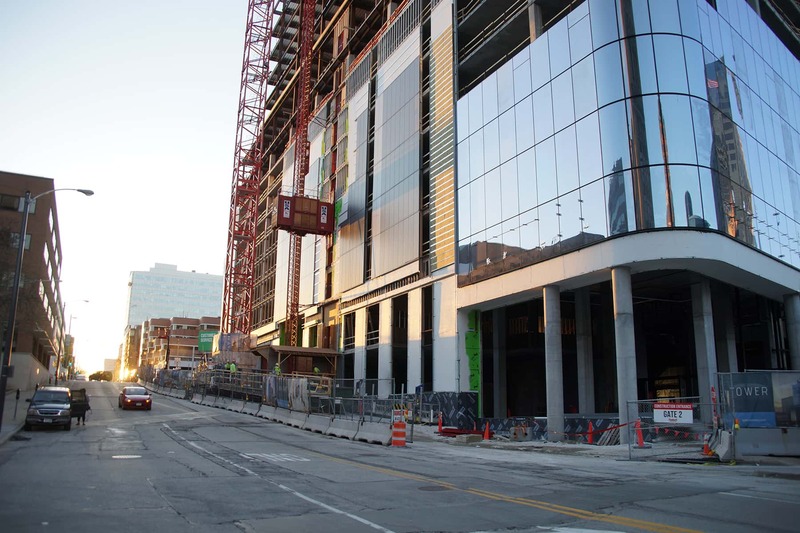 The $132 million tower replaced the 417-stall parking garage at the same corner. 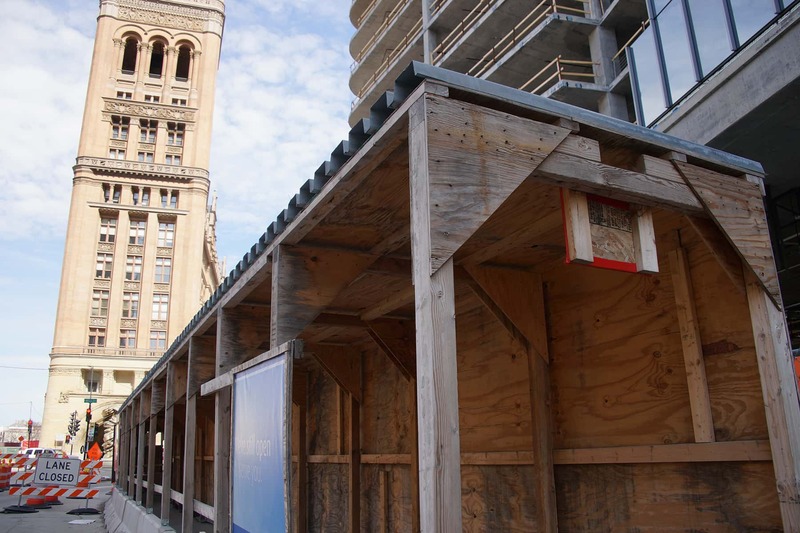 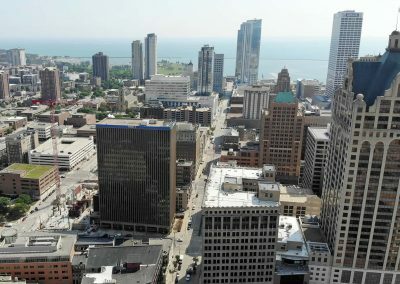 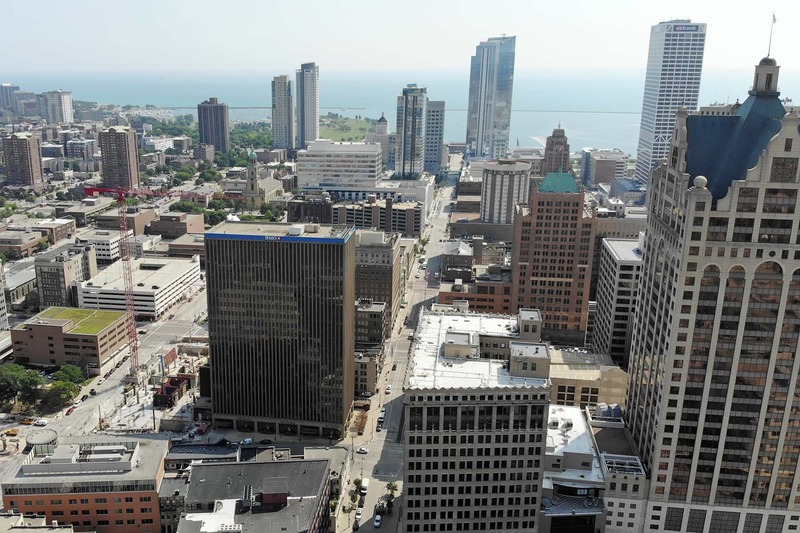 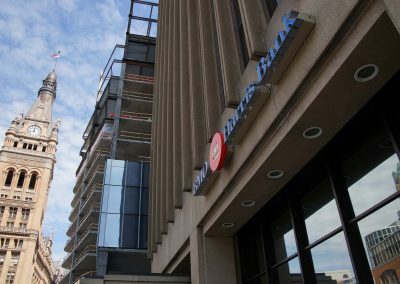 BMO will relocate to the new tower from its adjacent BMO Harris Bank Building. 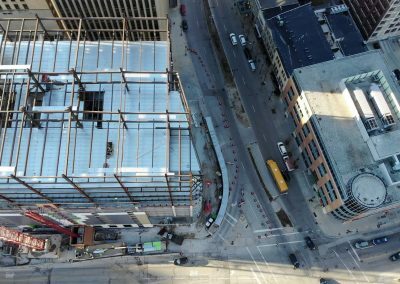 A mixed-use redevelopment of that 20-story space is planned. 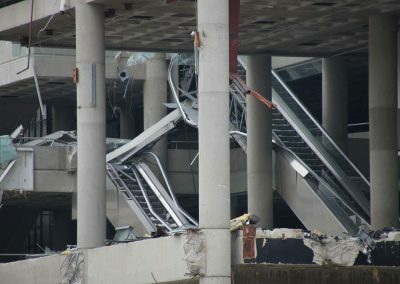 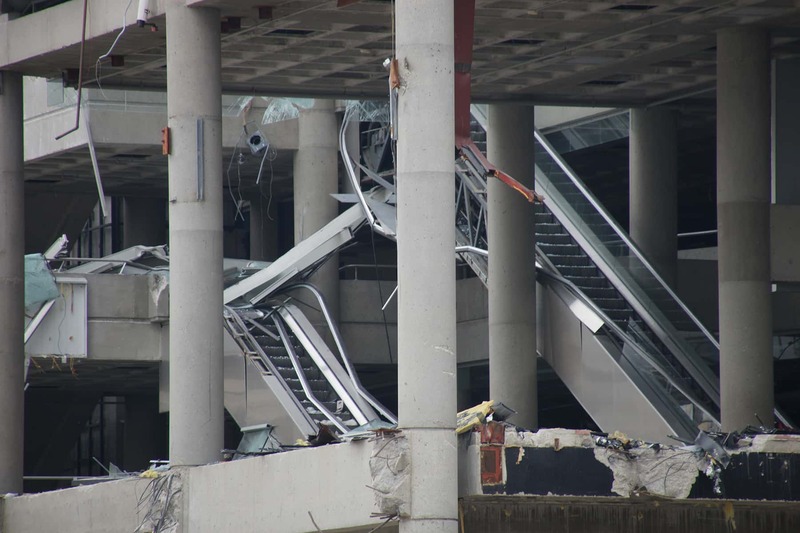 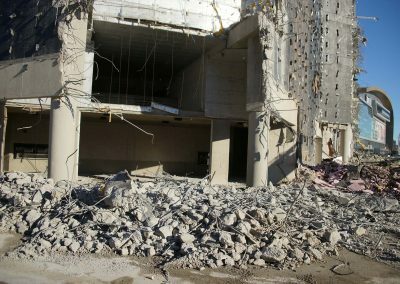 These photos show the conditions of both sites at similar times in March and April, as one rises and the other falls.